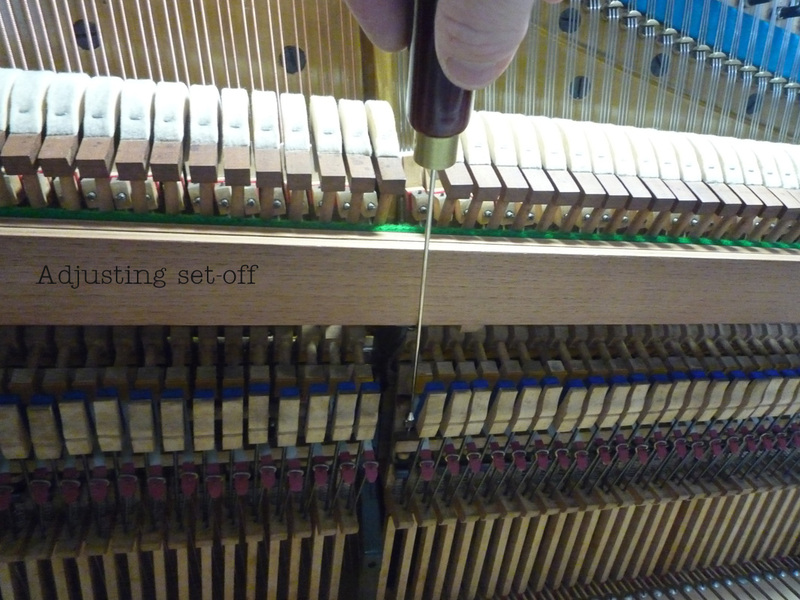 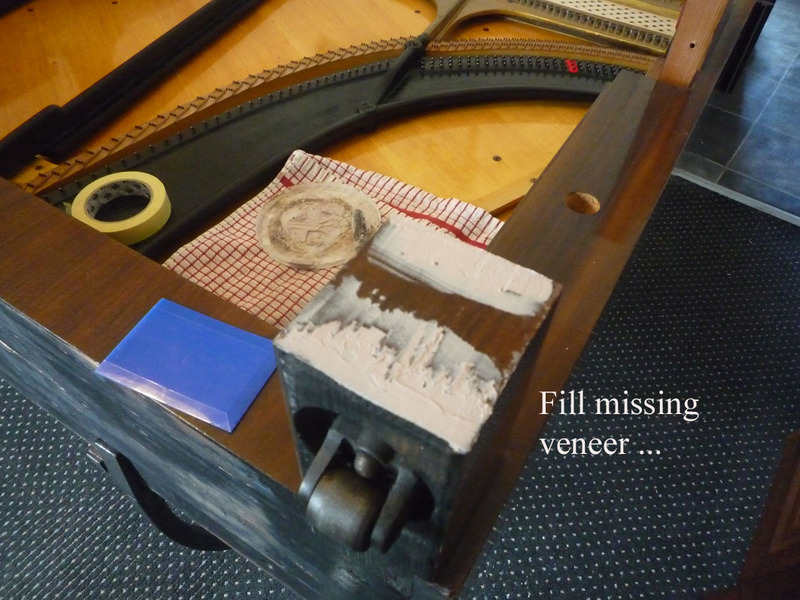 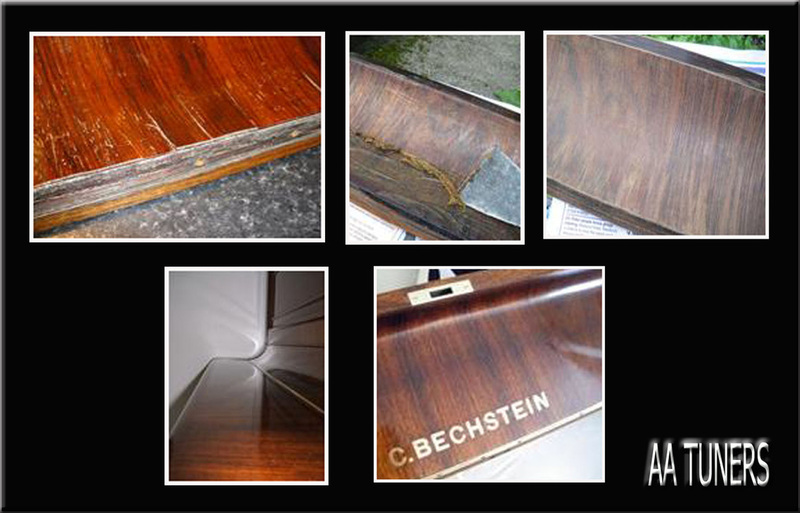 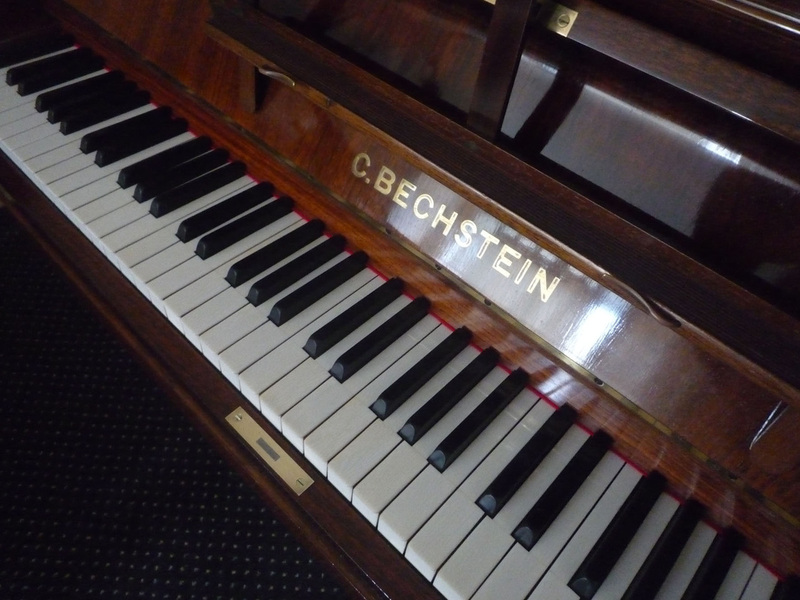 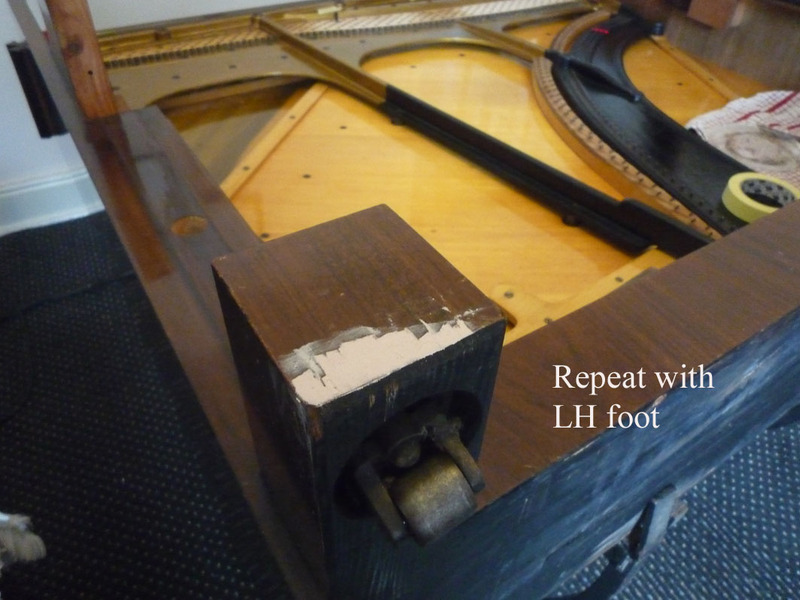 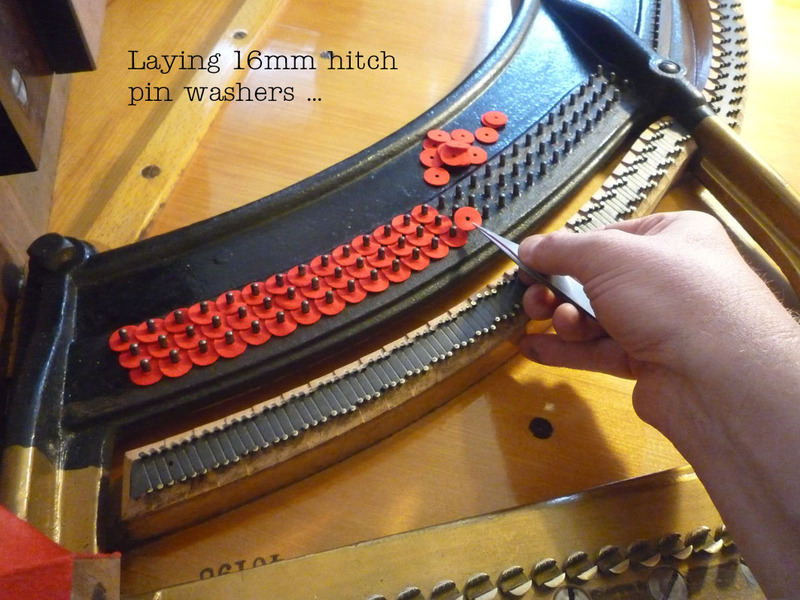 AA Piano Tuners UK showing a fully illustrated & annotated portfolio of a refurbishment taking place to a Bechstein Model 10 Upright Piano from start to finish. 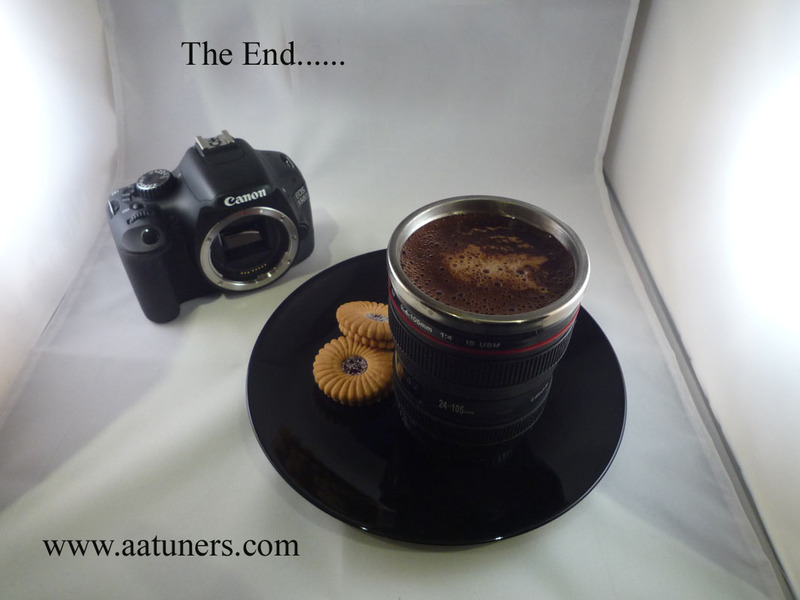 All images are Copyright and must not be duplicated or copied. 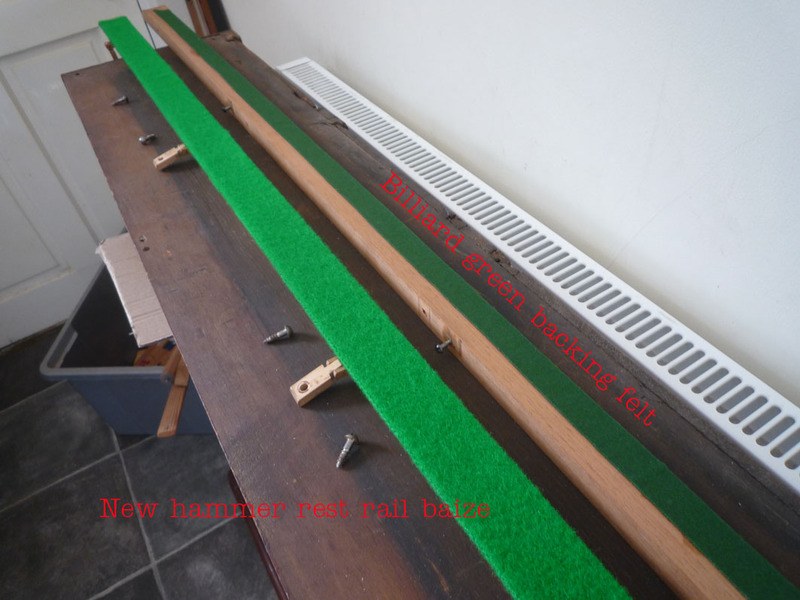 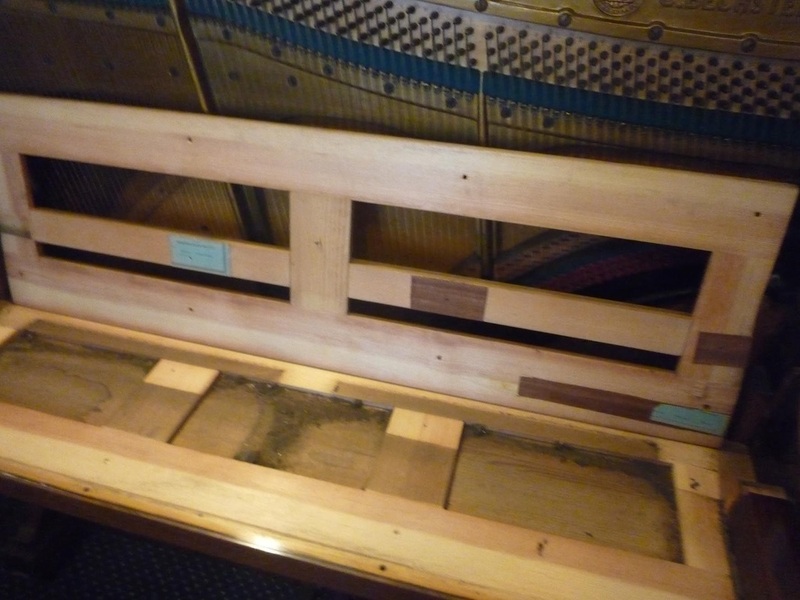 The original wrest plank, soundboard and bridges were still in very good condition after close inspection, so we agreed to take on the work. 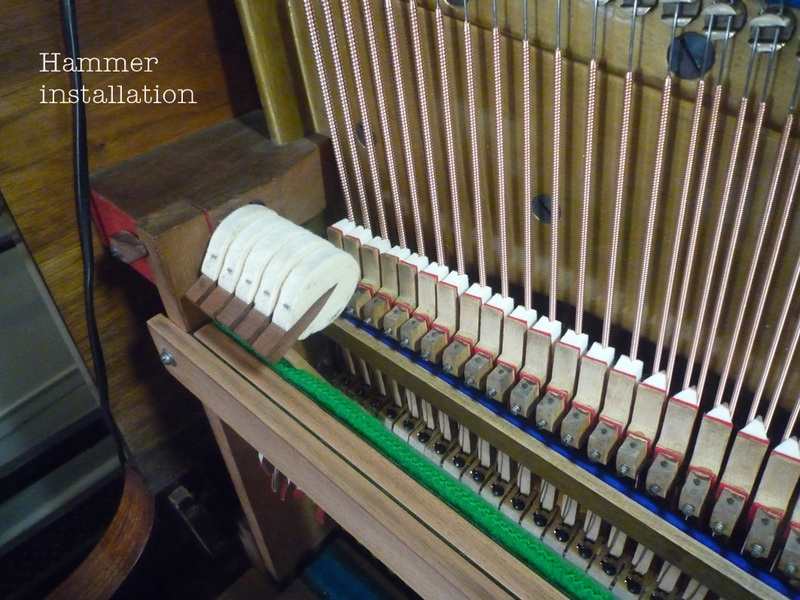 After trying to keep this piano in tune for several years, the customer decided to finally have the instrument refurbished. 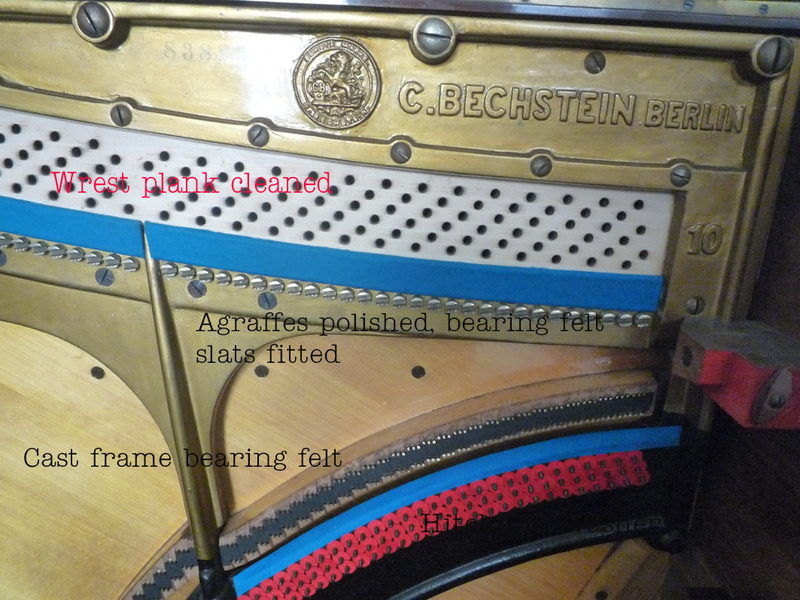 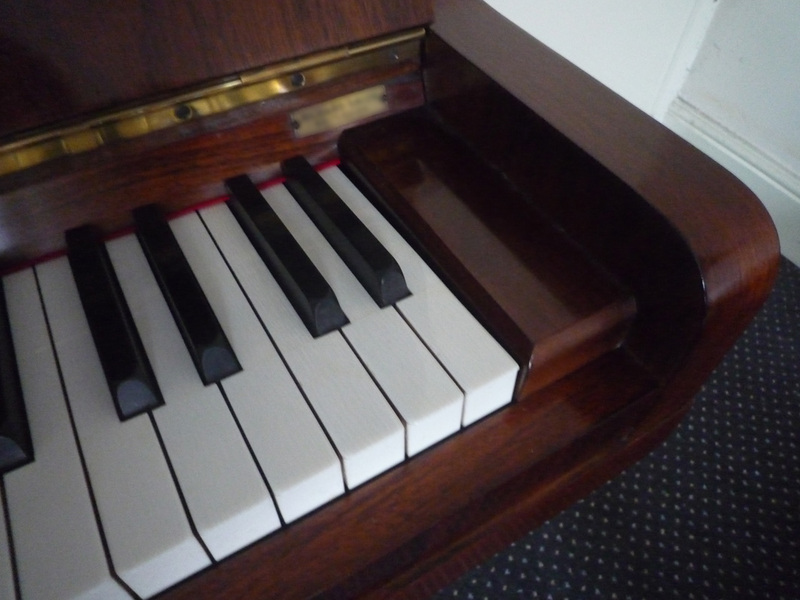 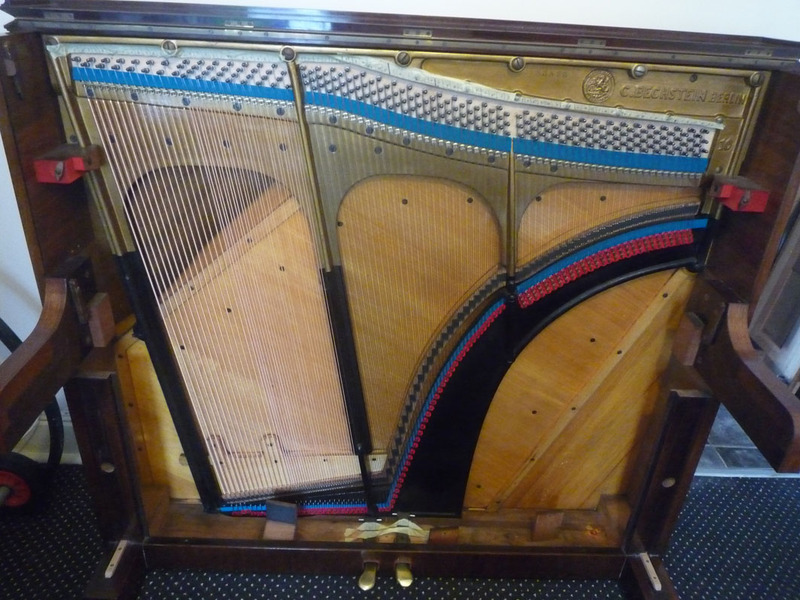 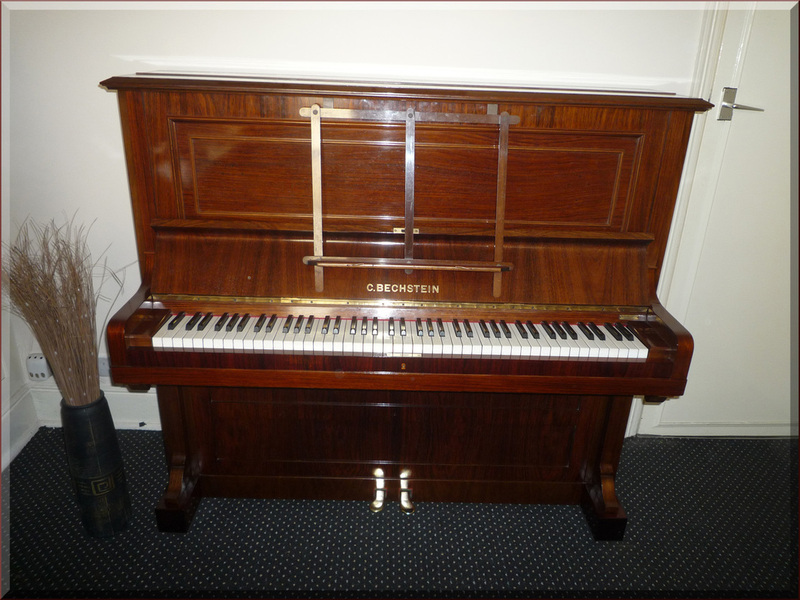 This piano has been re-strung, mechanism/keyboard/pedals refurbished, and the casework has been partially re-polished repairing all scratches to the veneer. 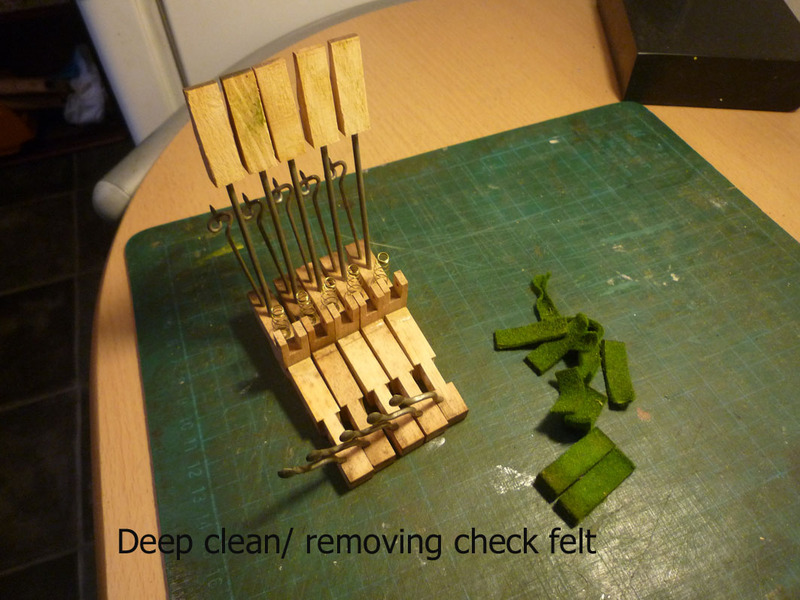 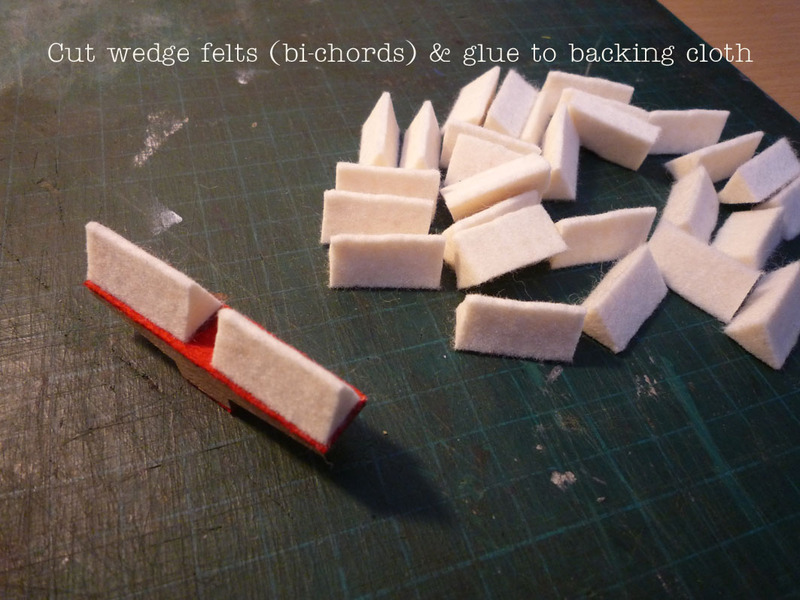 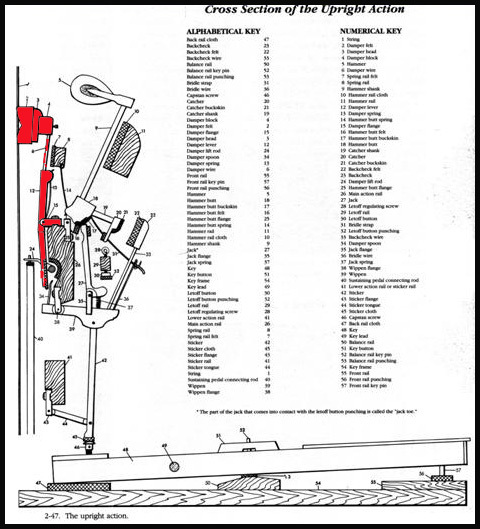 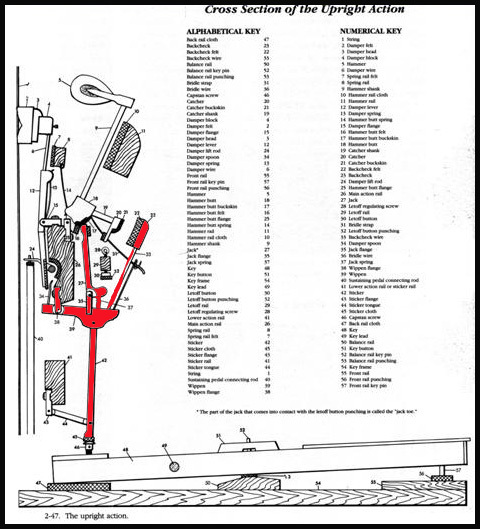 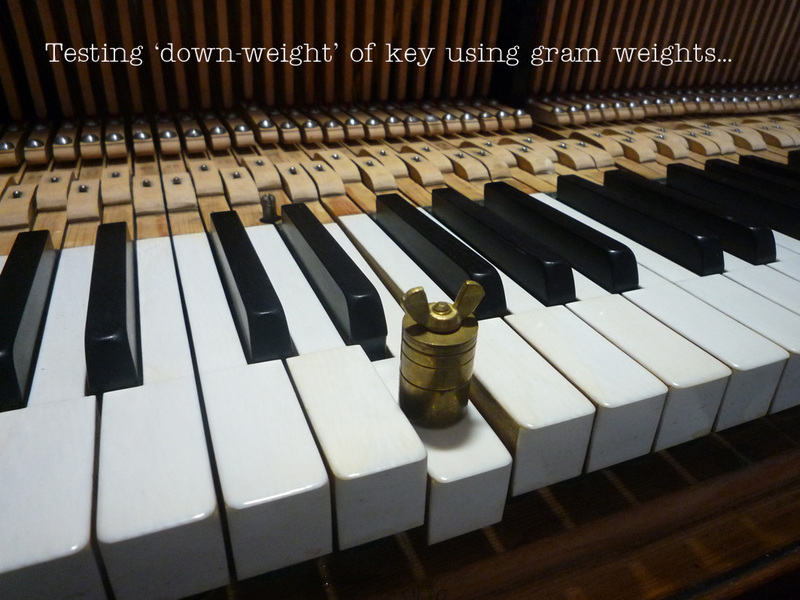 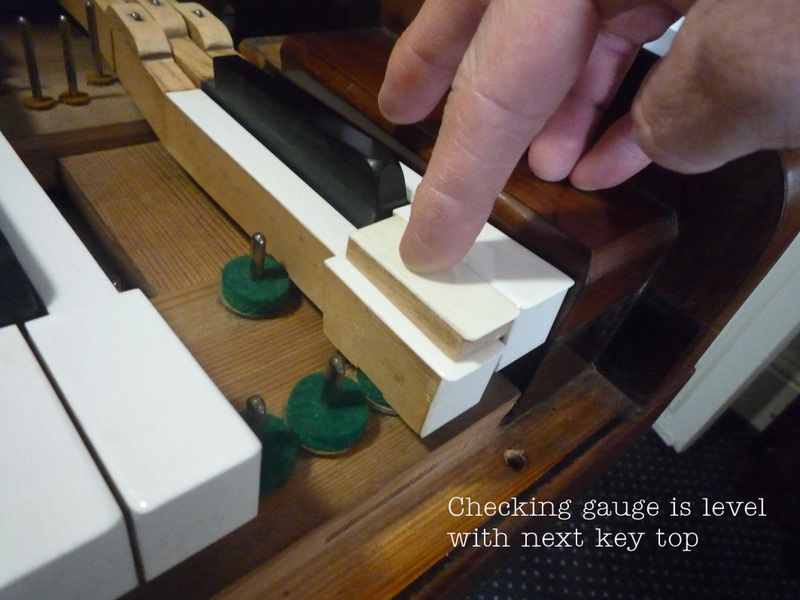 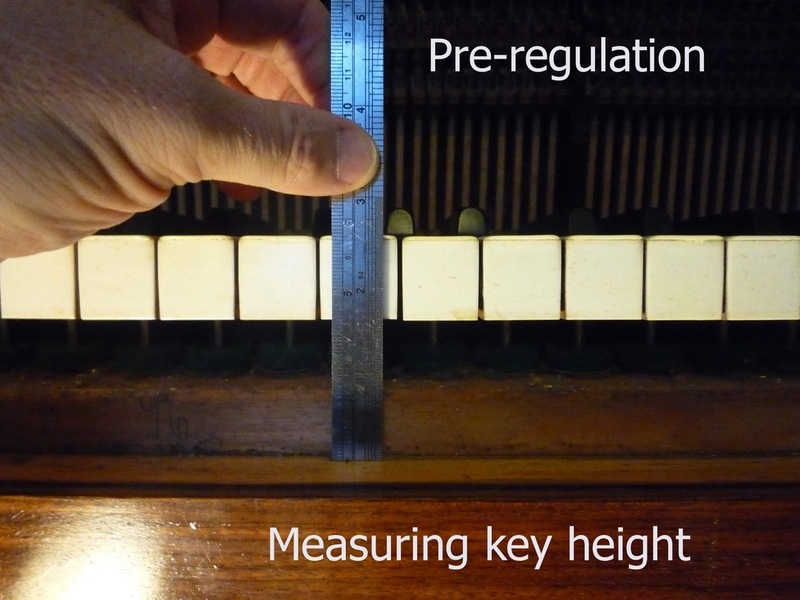 Prior to dismantling the keyboard and mechanism, various spot-check measurements are made to the height, depth and gaps of certain parts with a rule and jigs (pre-regulation). 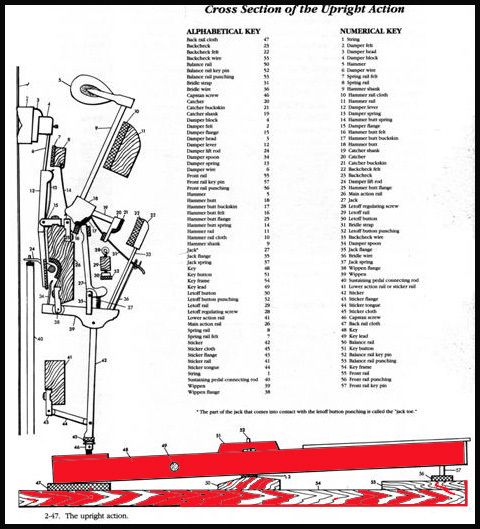 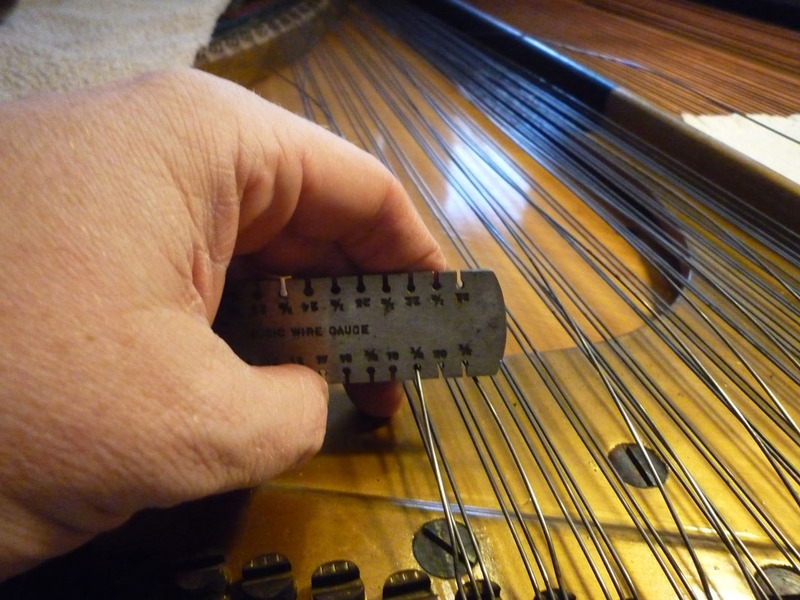 These measurements are recorded as a guide for later when the refurbished parts are re-assembled. 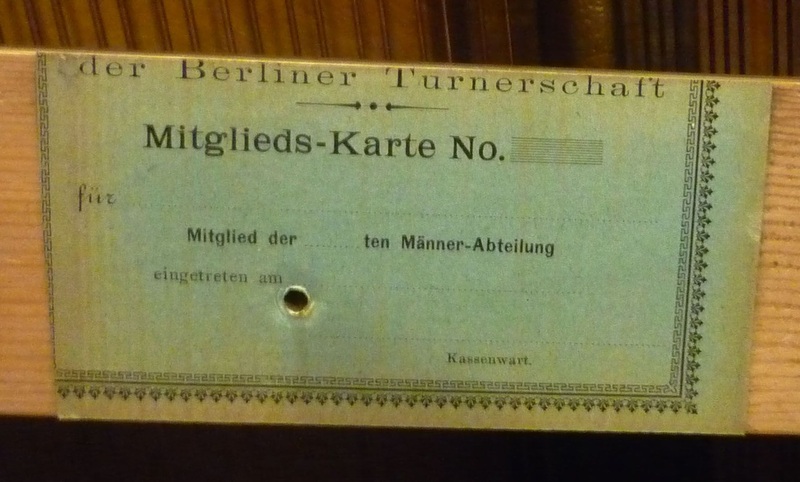 German calendar used as spacers ! 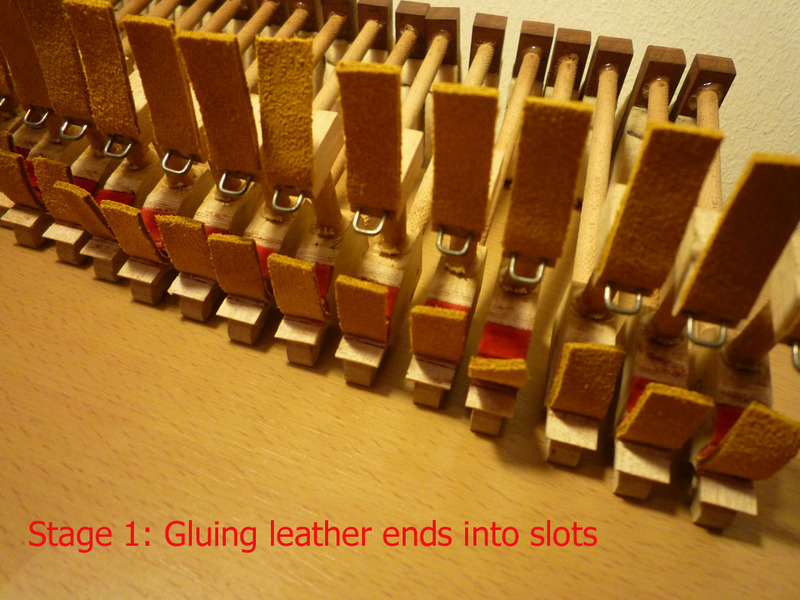 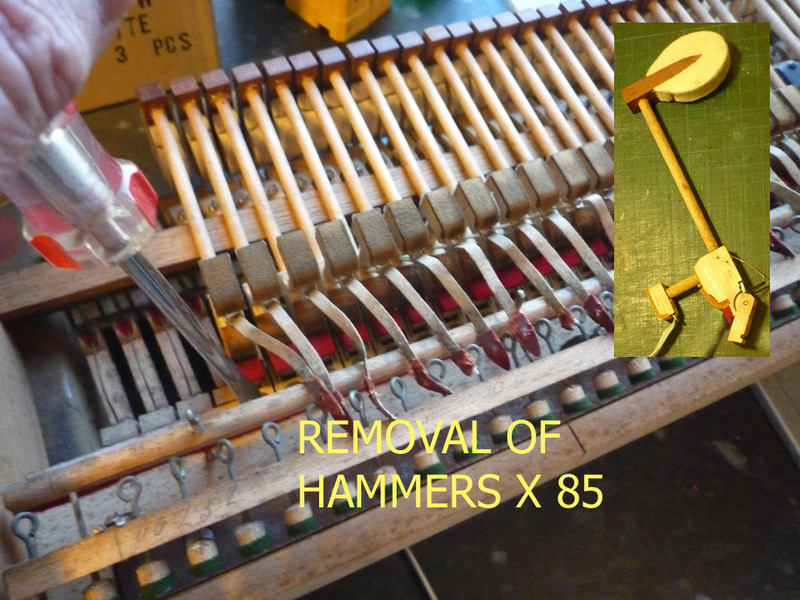 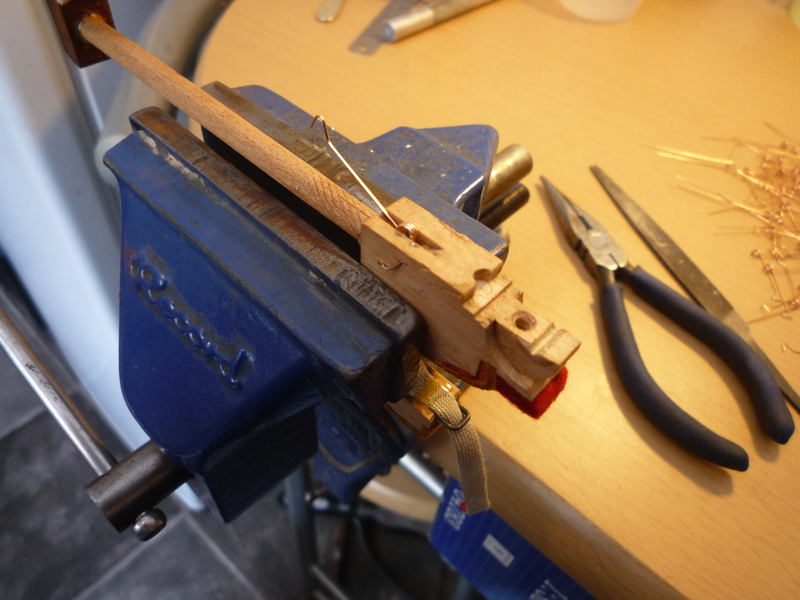 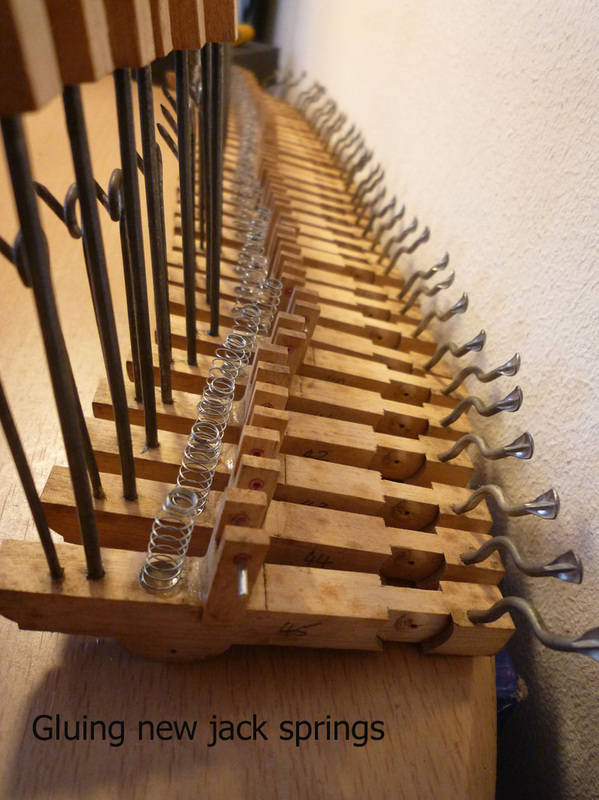 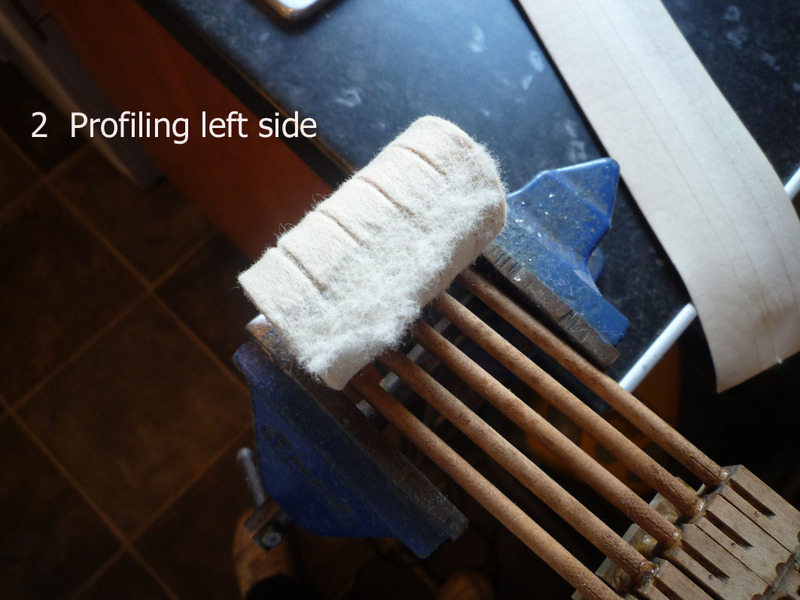 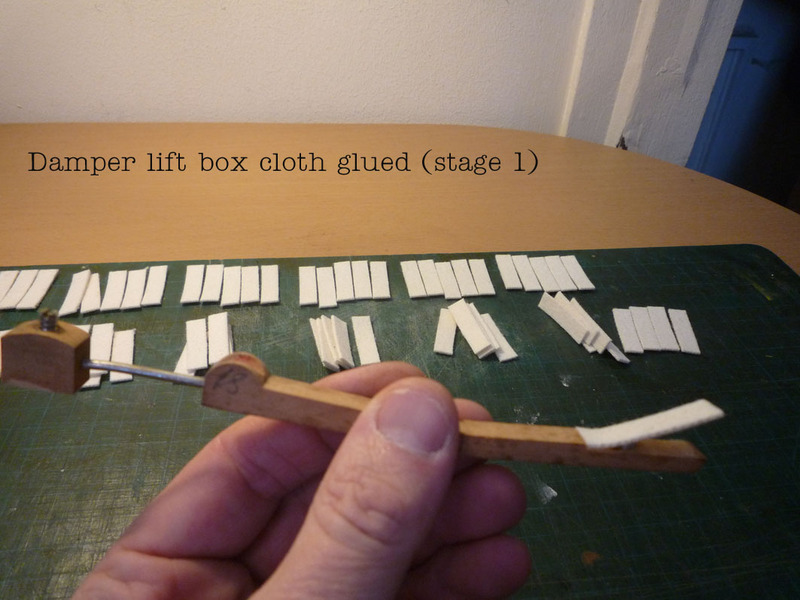 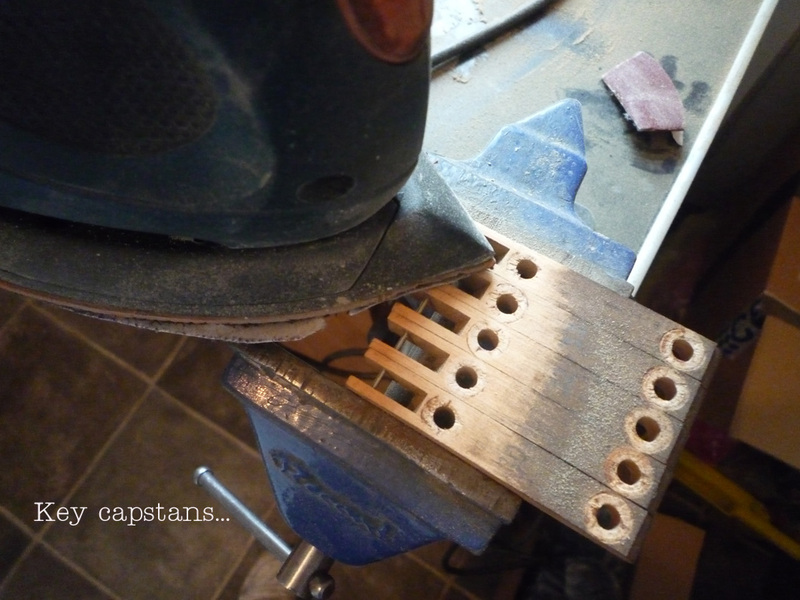 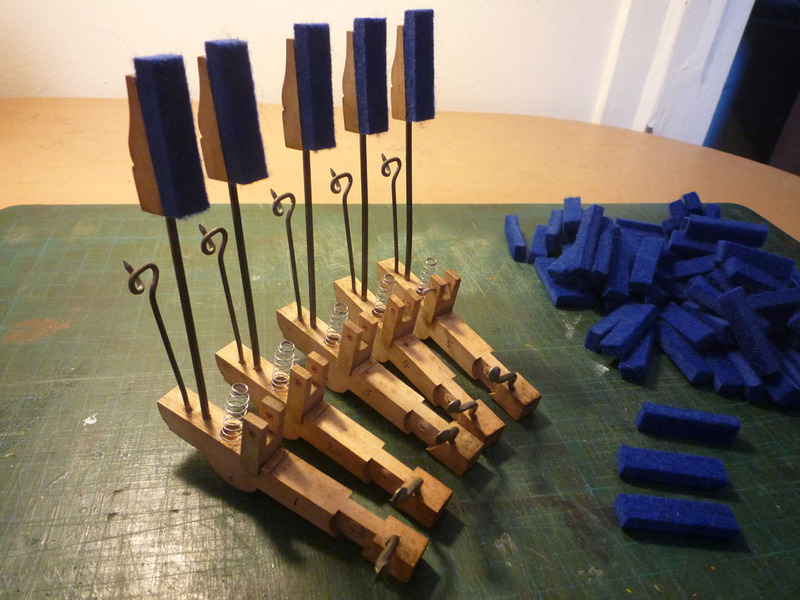 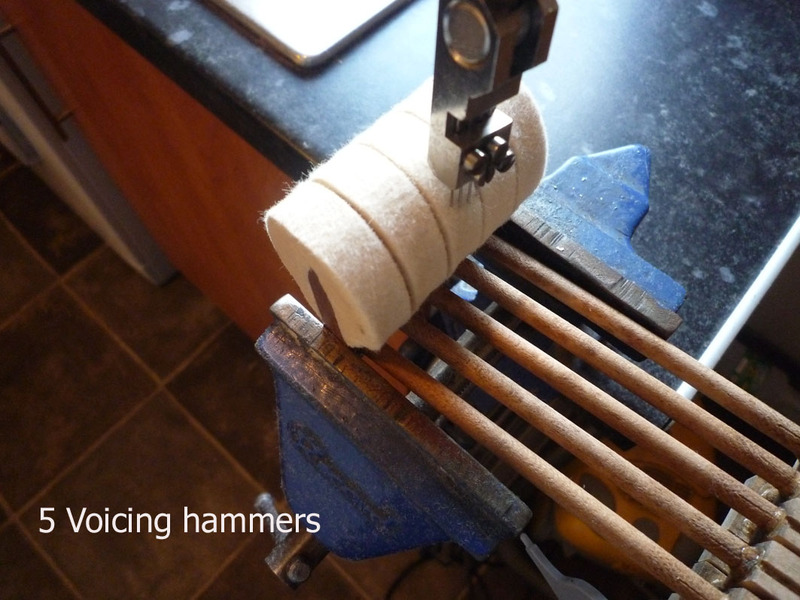 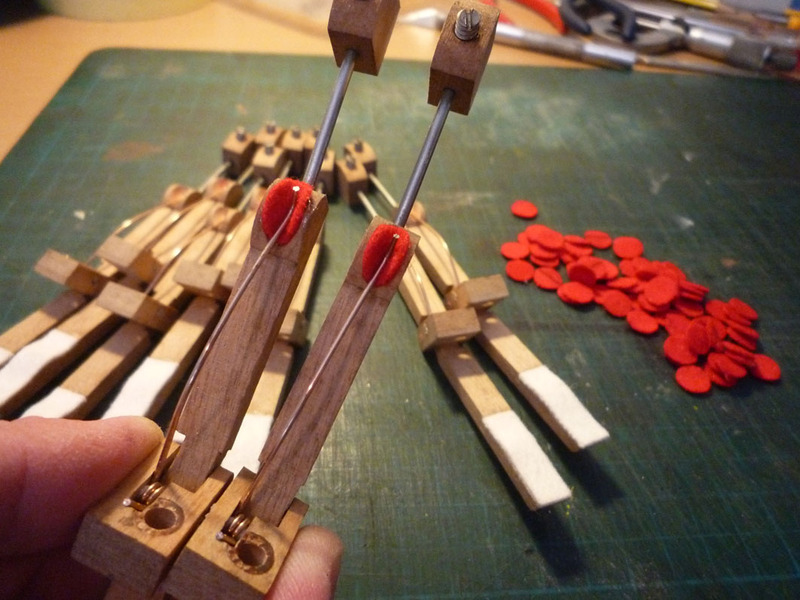 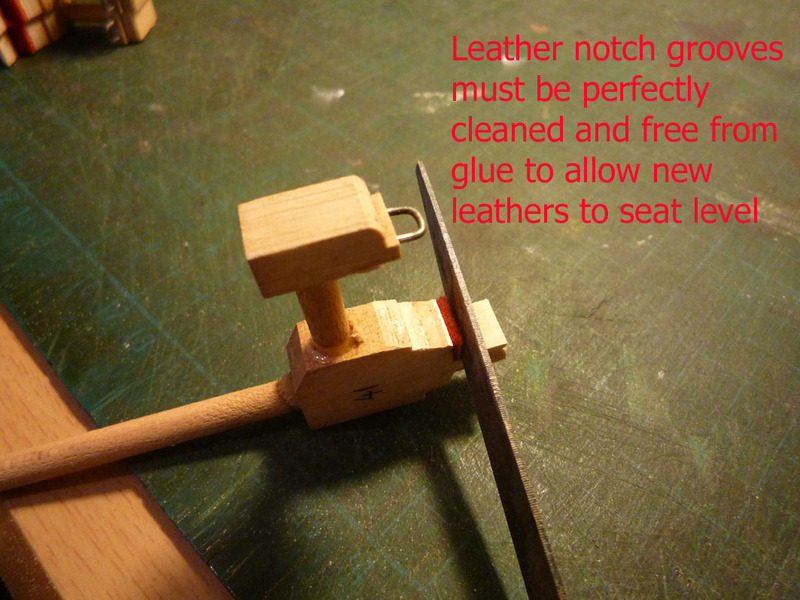 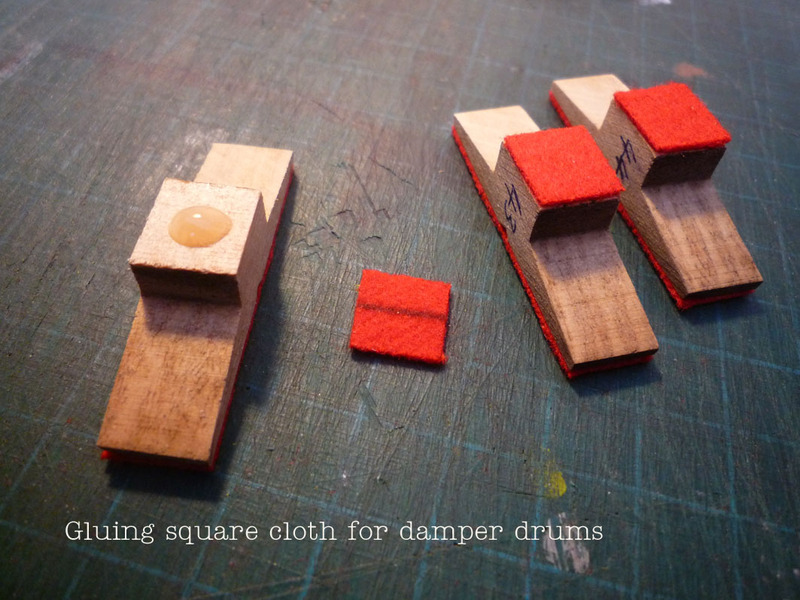 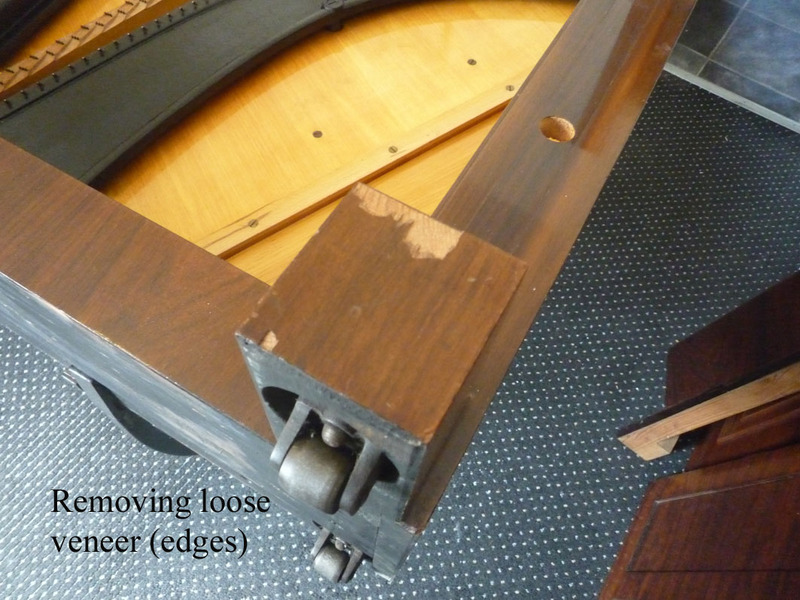 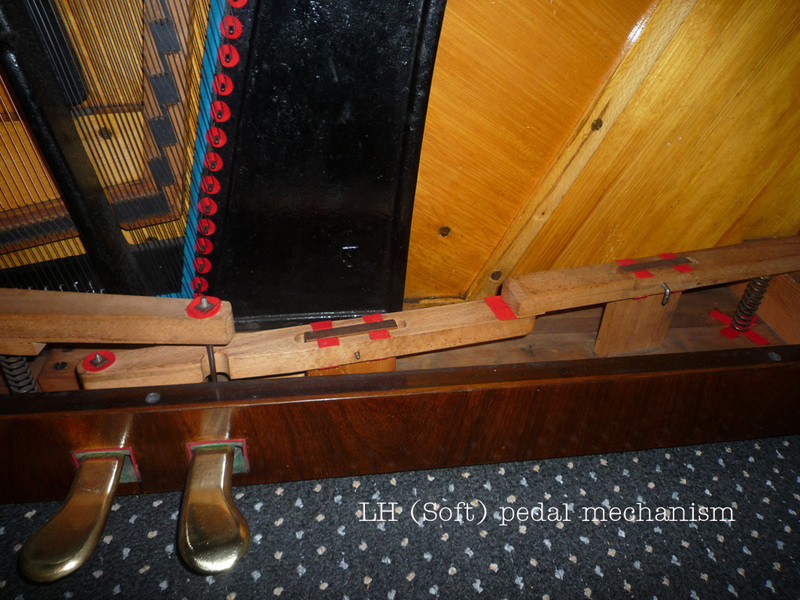 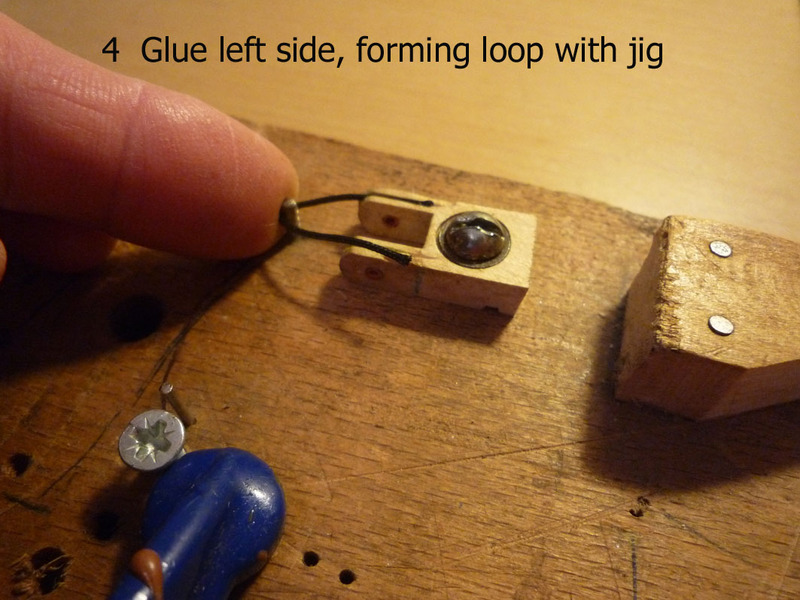 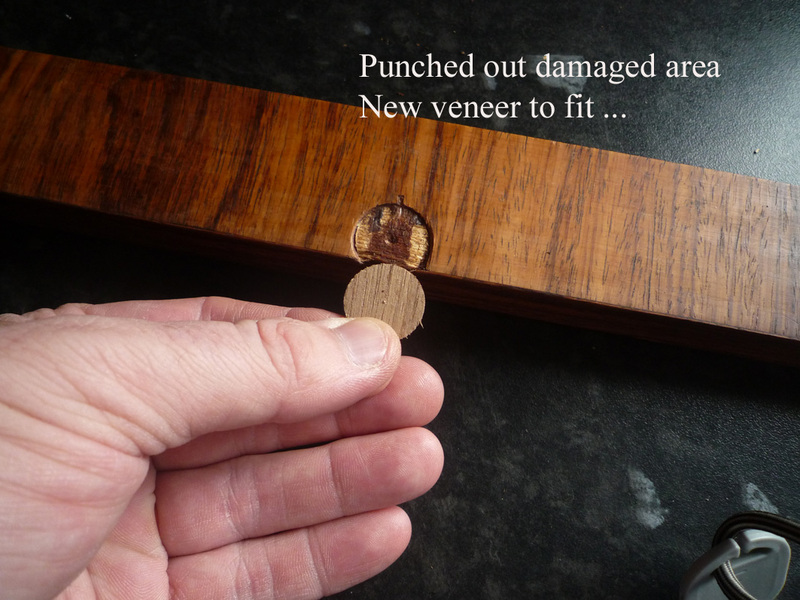 <2> Before the strings are removed, the pedal hinge box, rockers and lift rods are dismantled to allow easy access to the bass & tenor string's hitch pins. 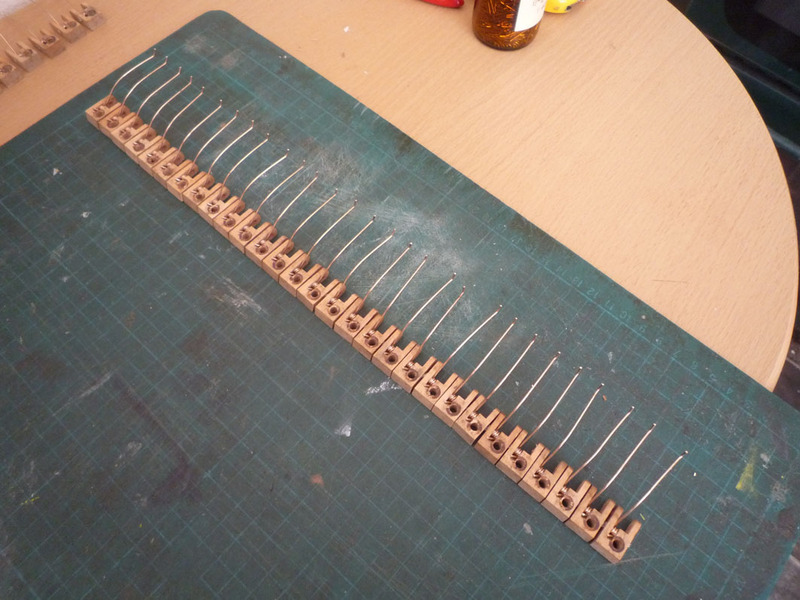 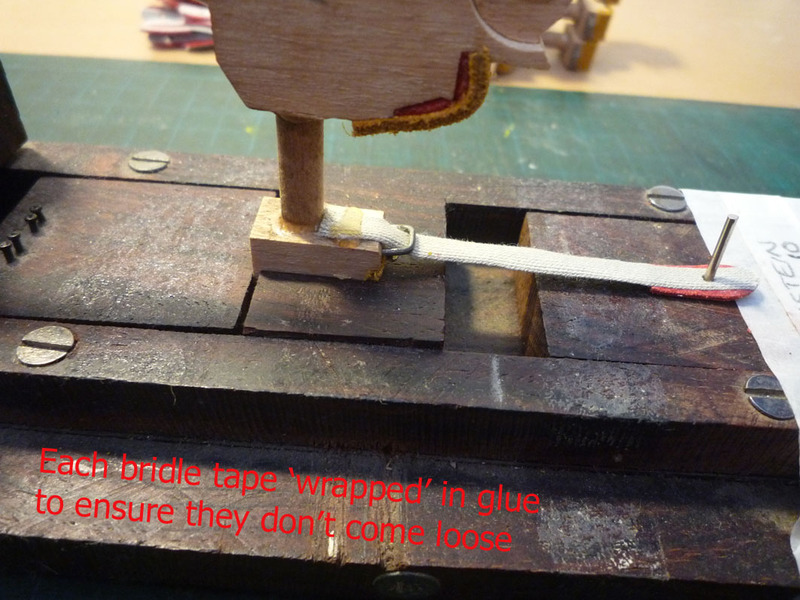 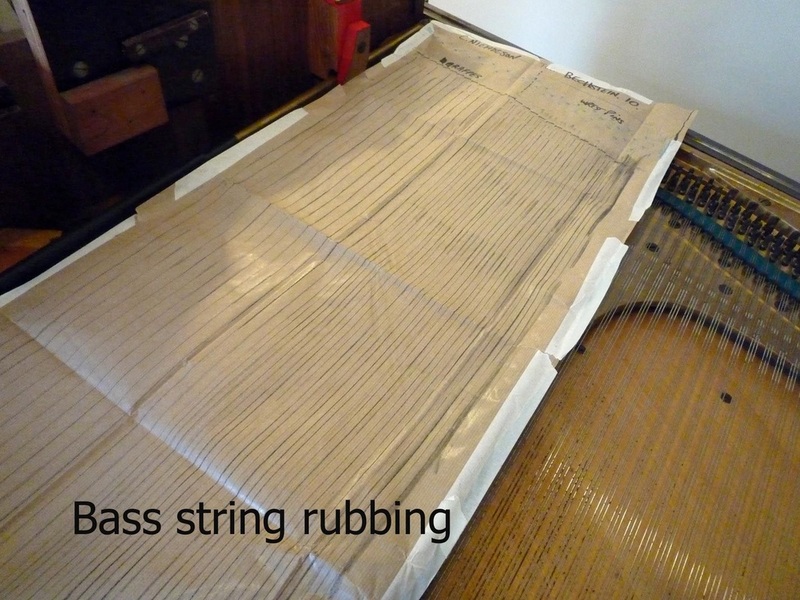 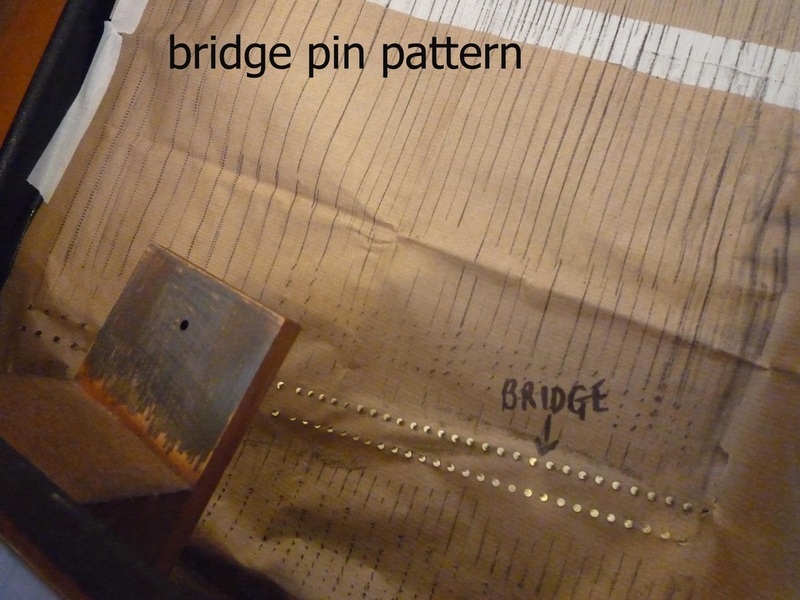 Brown paper is then stretched across the bass strings, and penetrated through the bridge pins before a crayon rubbing is made. 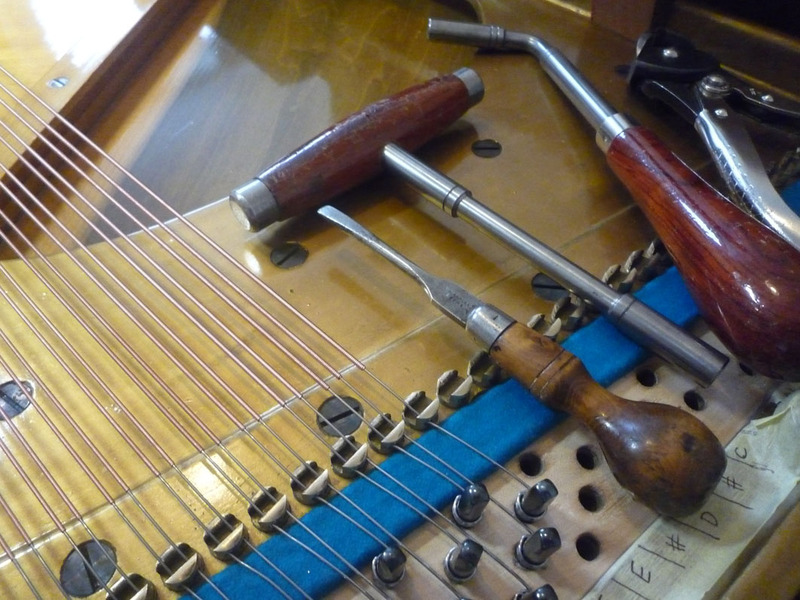 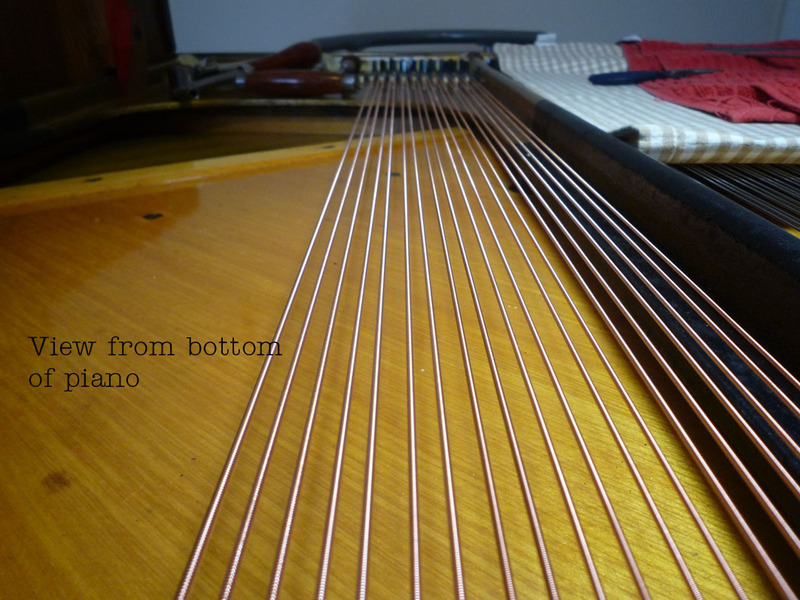 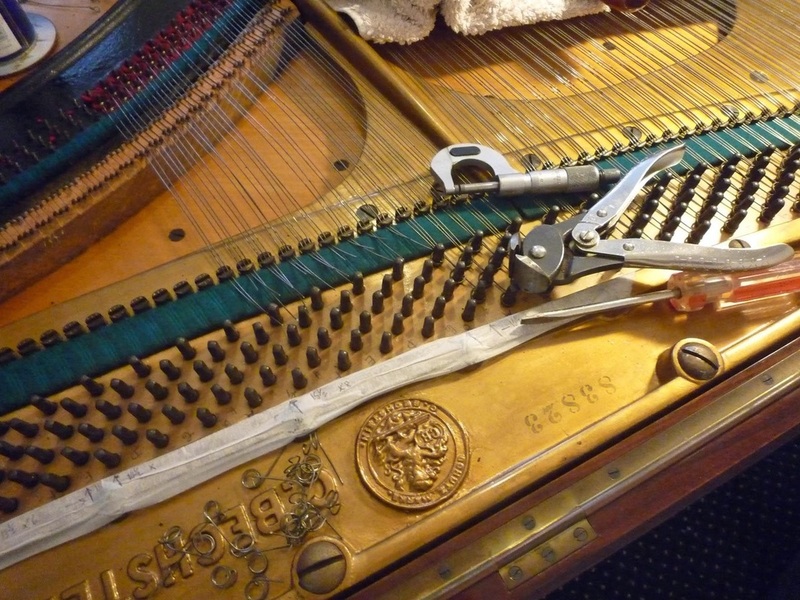 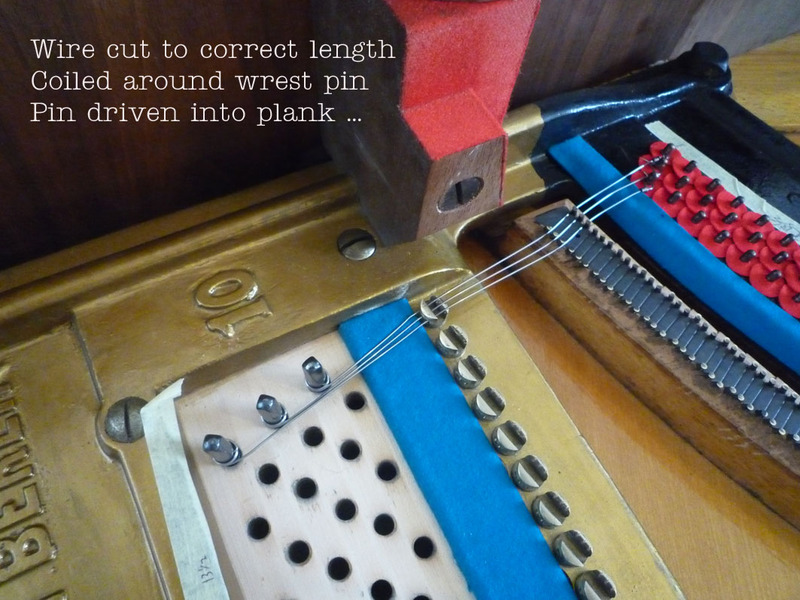 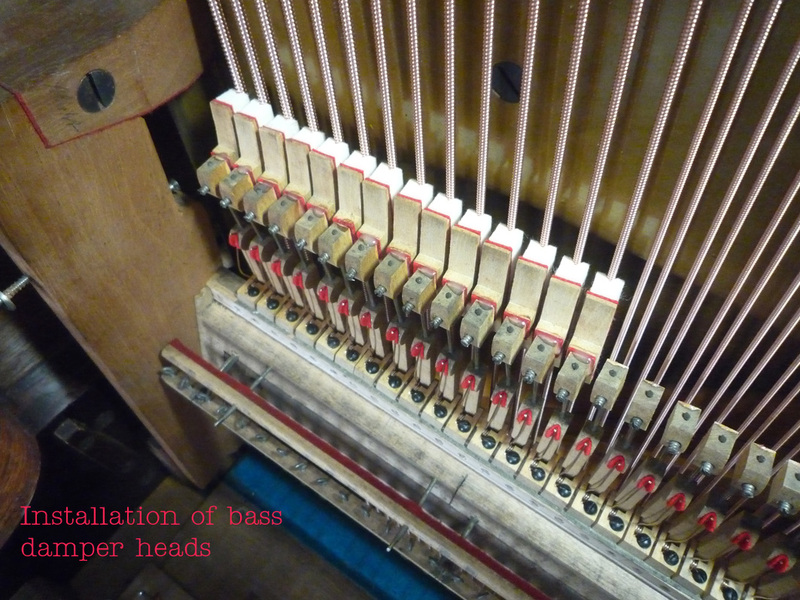 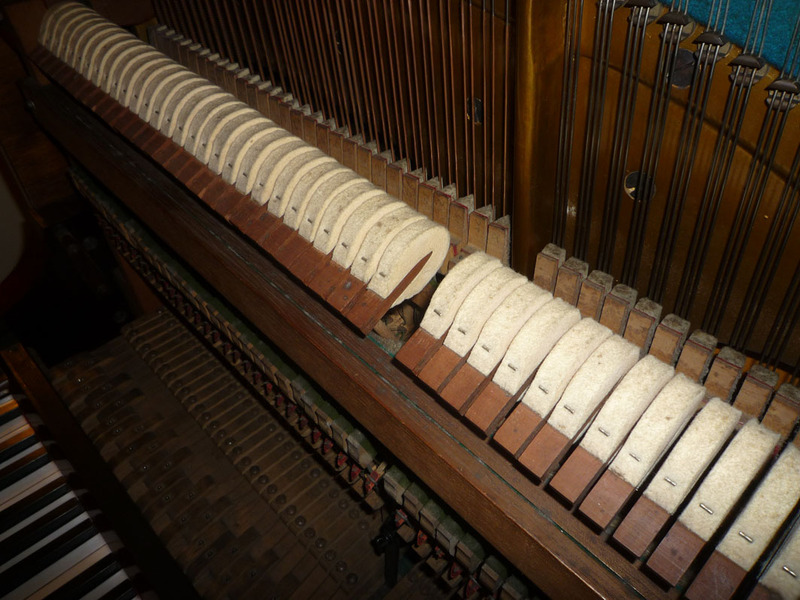 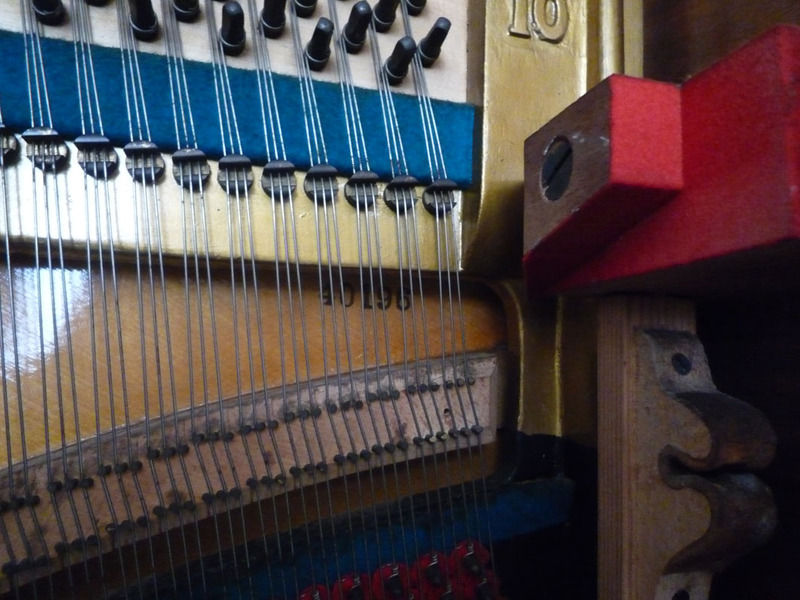 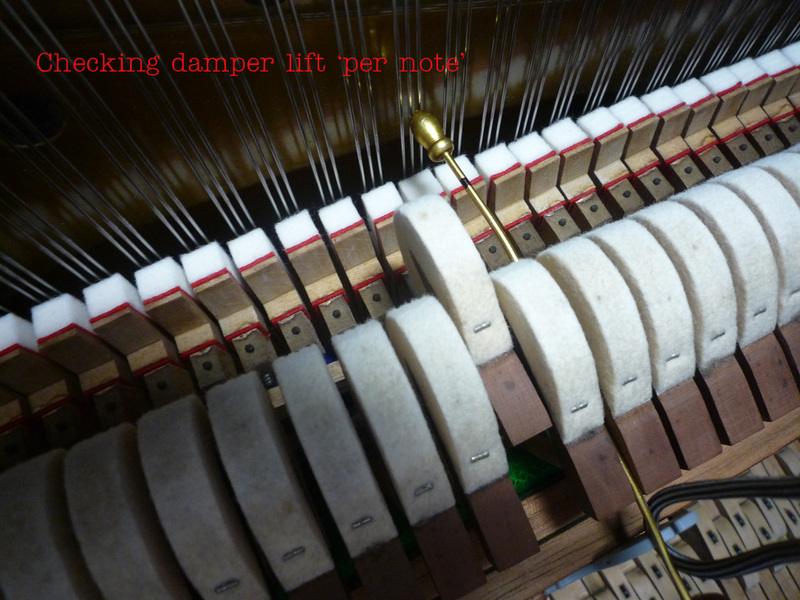 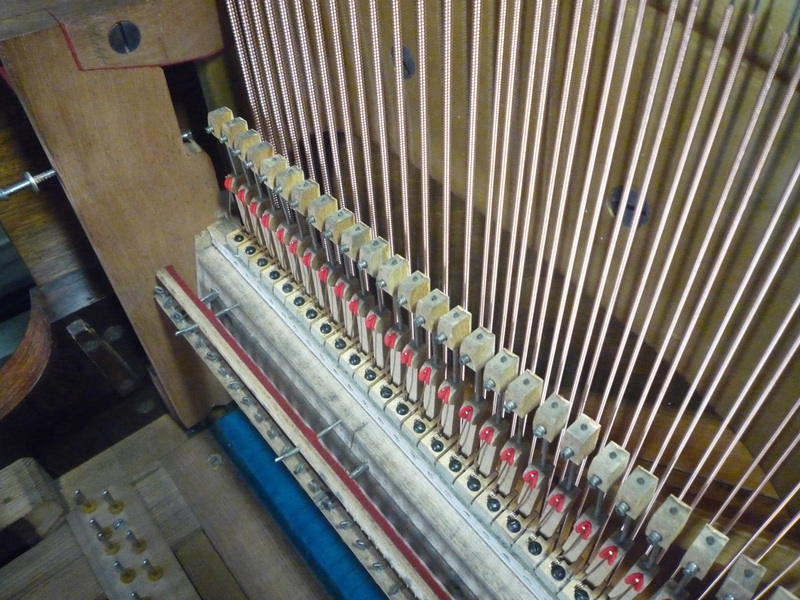 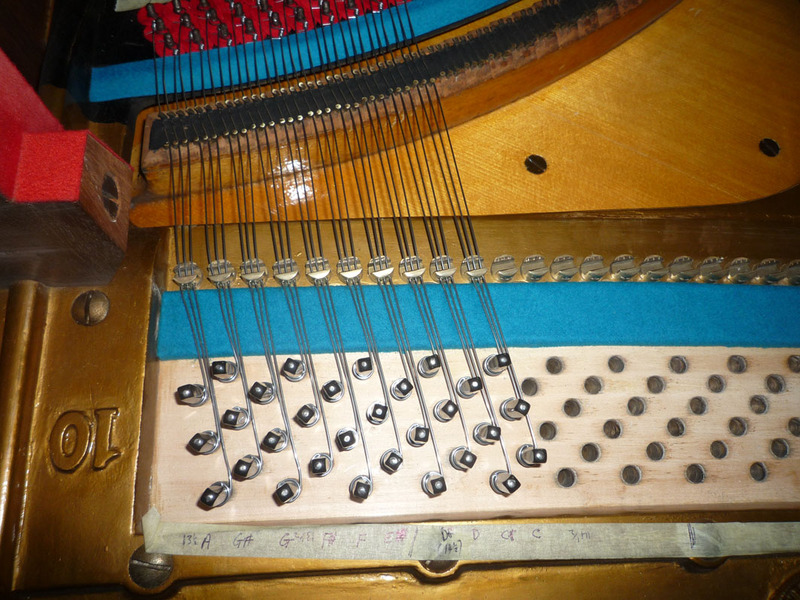 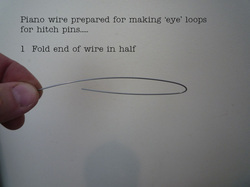 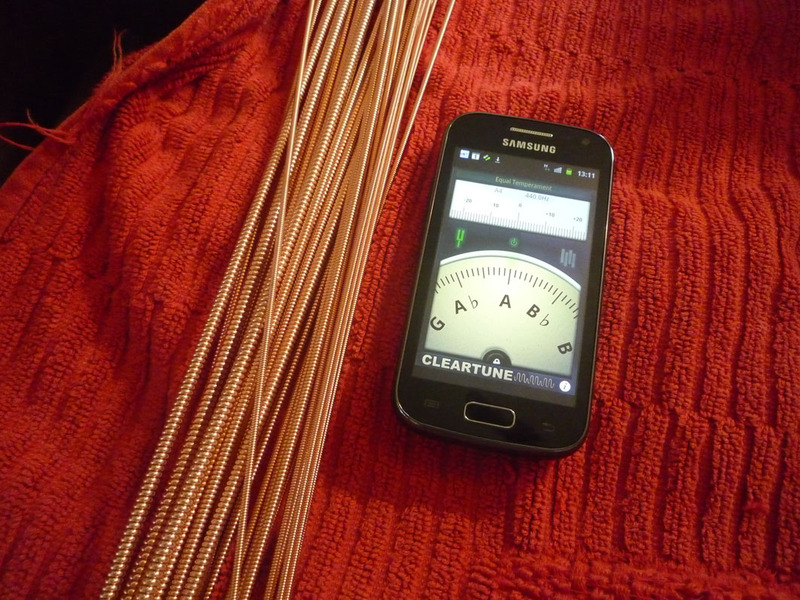 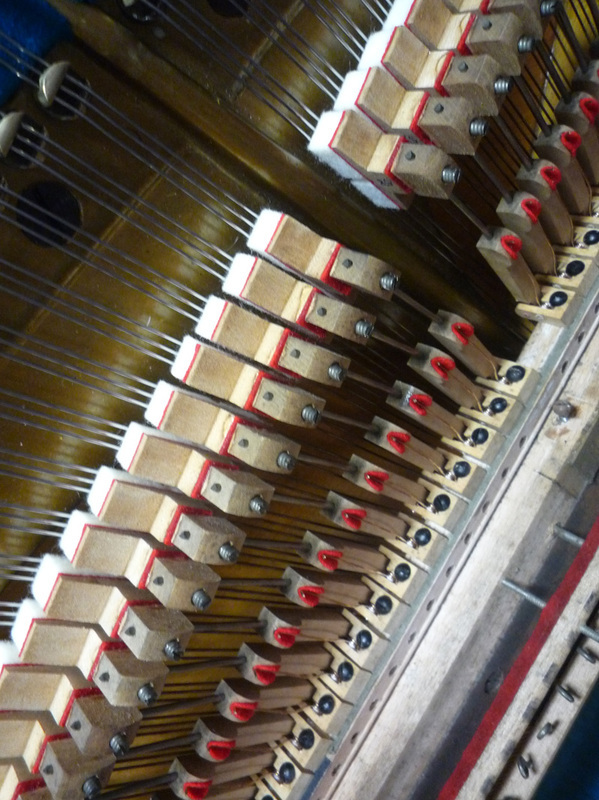 Prior to removing the strings, the tension (about 16 tons) must be released very slowly, using small movements from the tuning lever on each of the 215 tuning pins. 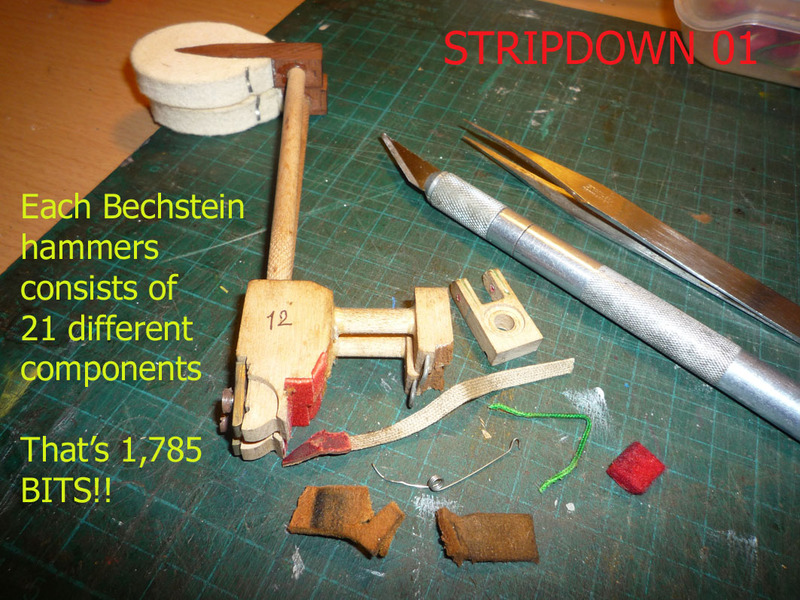 Mechanism dismantled: 170 main components are numbered then carefully removed. 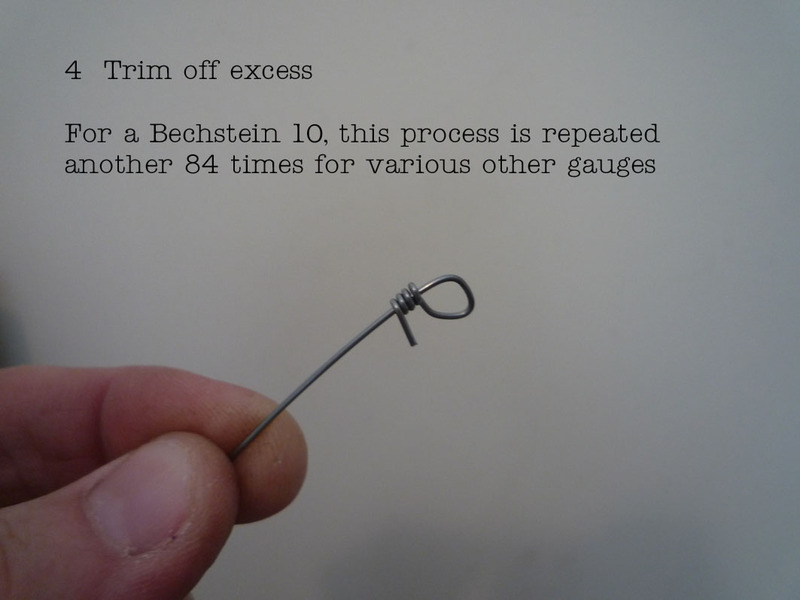 A model 10 has two different hooking methods for attaching steel wire. 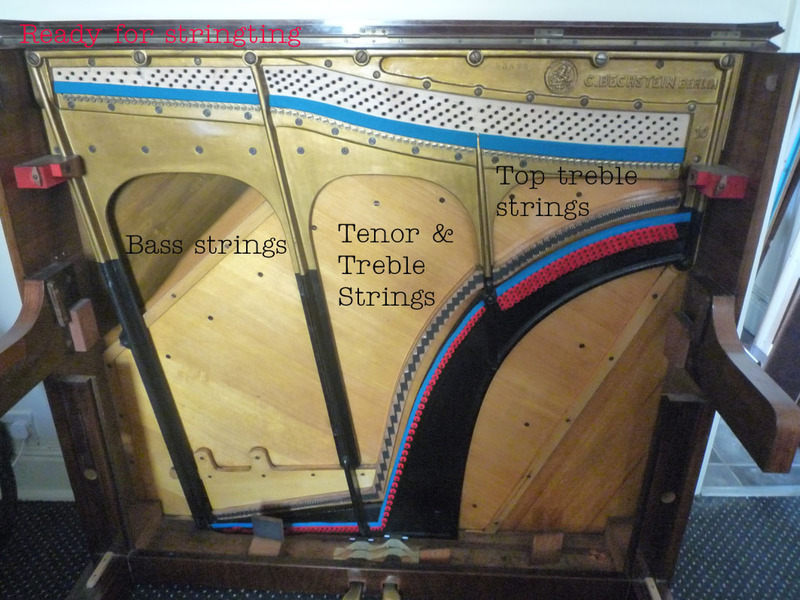 The top treble section here is strung by each wire having its own 'eye' - like all guitar strings. 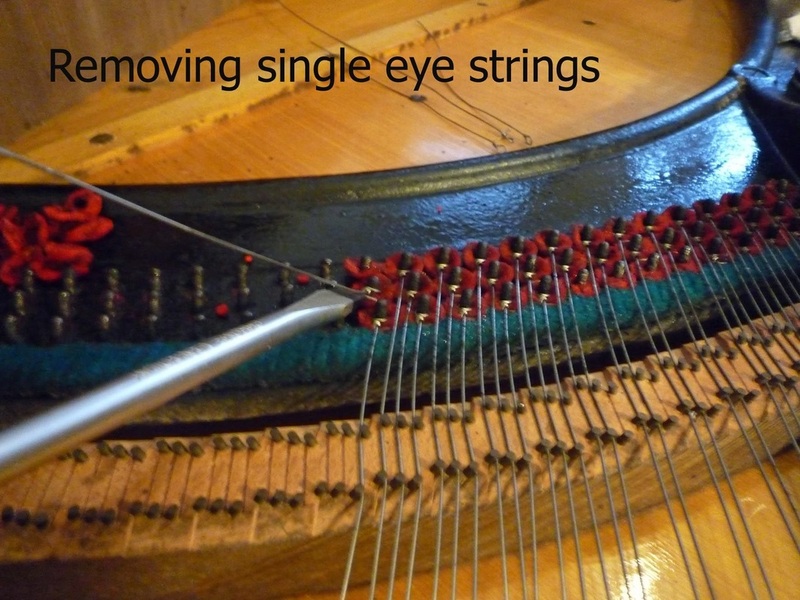 Each eye must be made by hand producing 3 neat coils to ensure maximum tension & tuning stability. 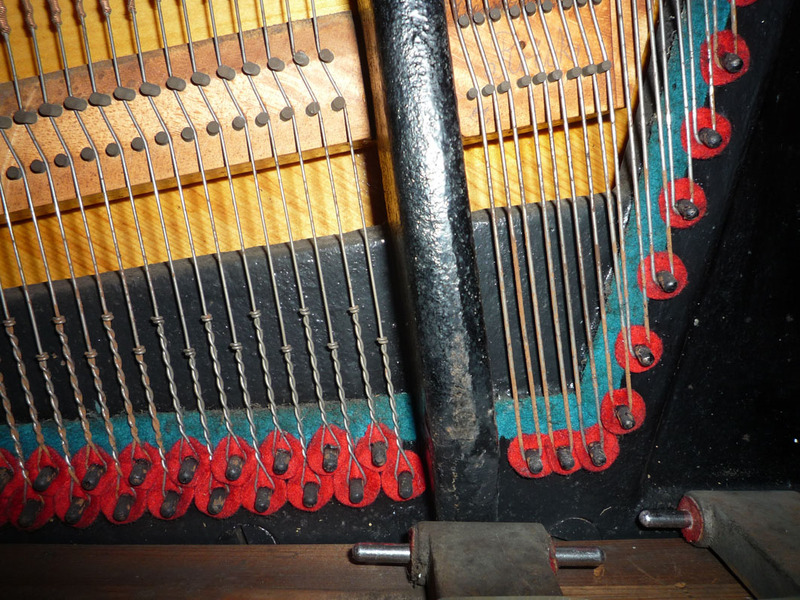 All eyes are hooked around its own hitch pin, at the bottom of the cast iron frame. 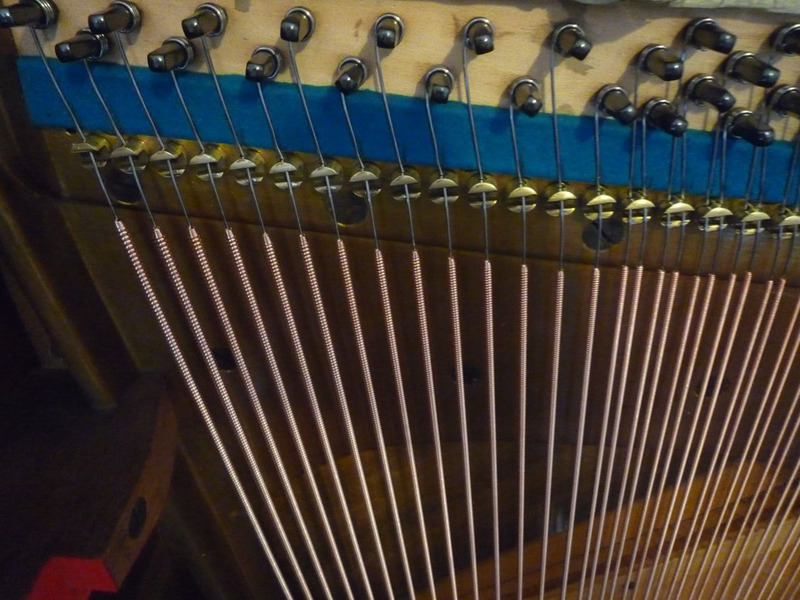 3 strings produce one note on a piano for the treble regions. 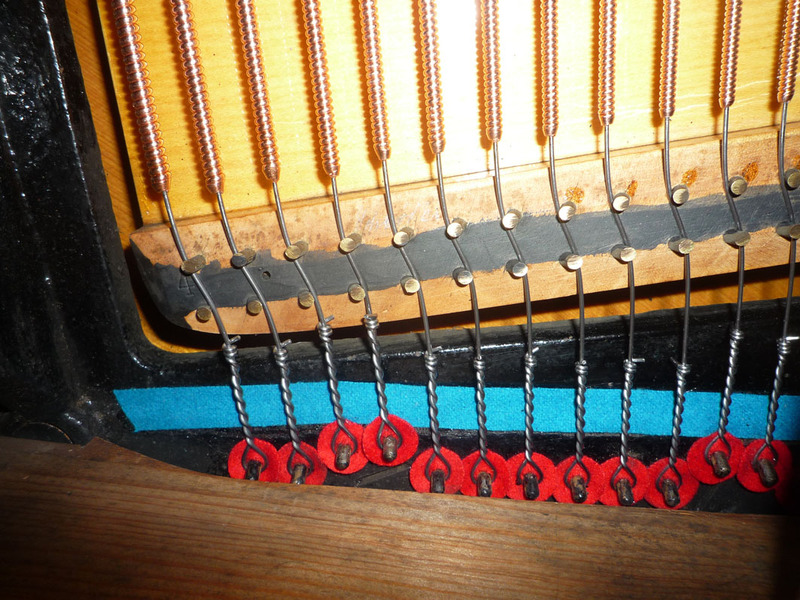 Starting its journey from the hitch pin (red), then rides over a cast bearing point (blue) then steered around the bridge, guided by pins (black). 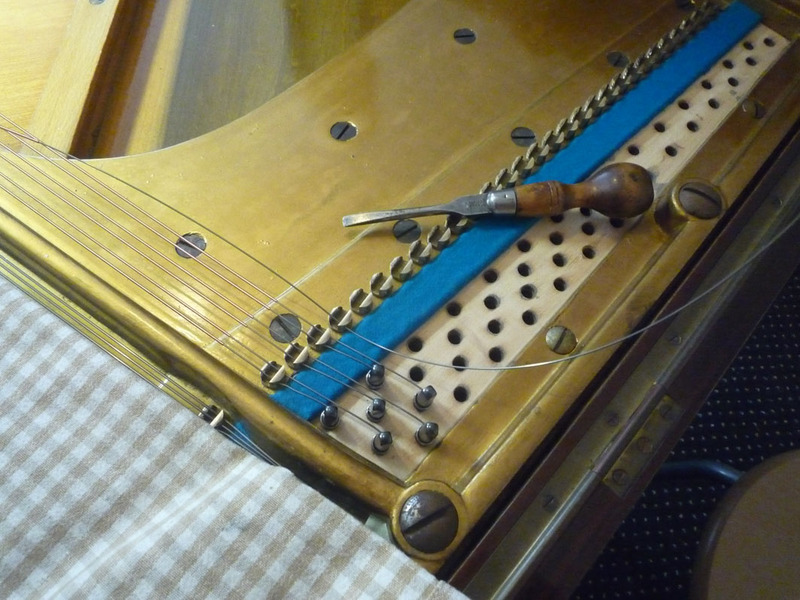 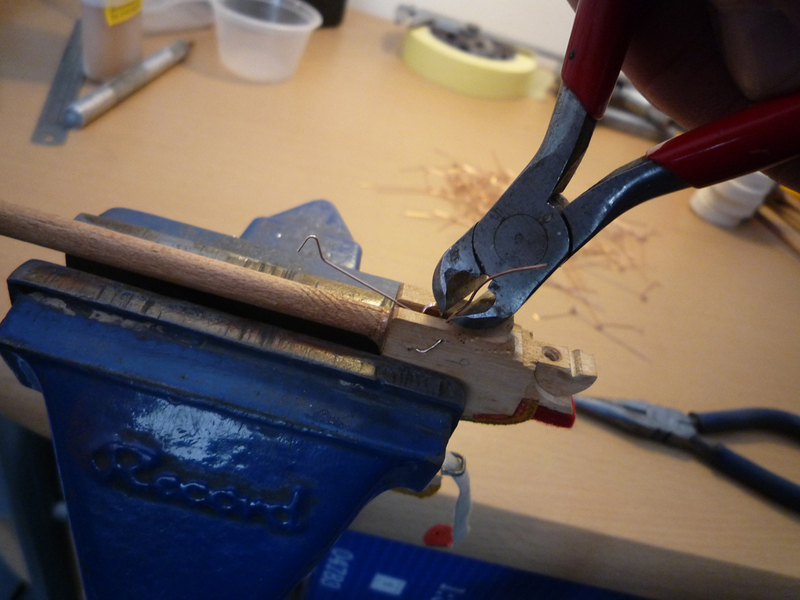 The string then passes through a brass stud (agraffe) before being attached & wound around a tuning pin. 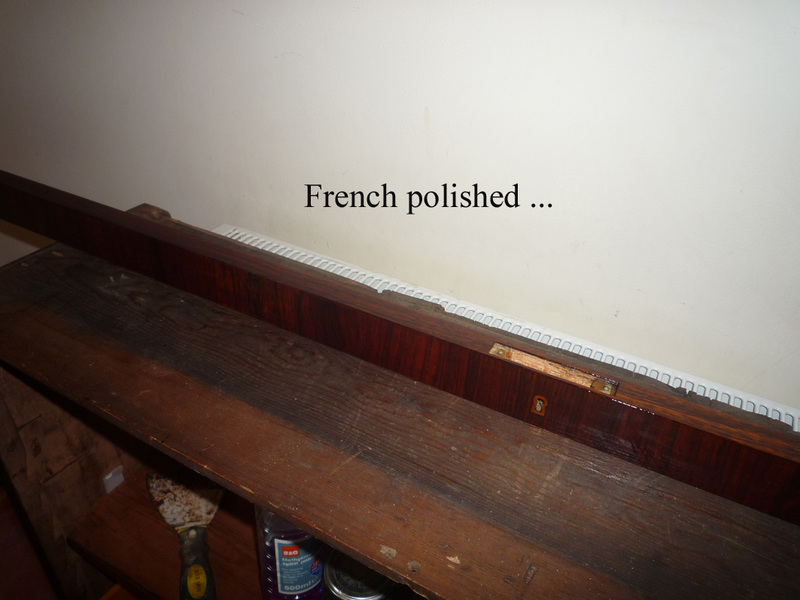 in various installments. 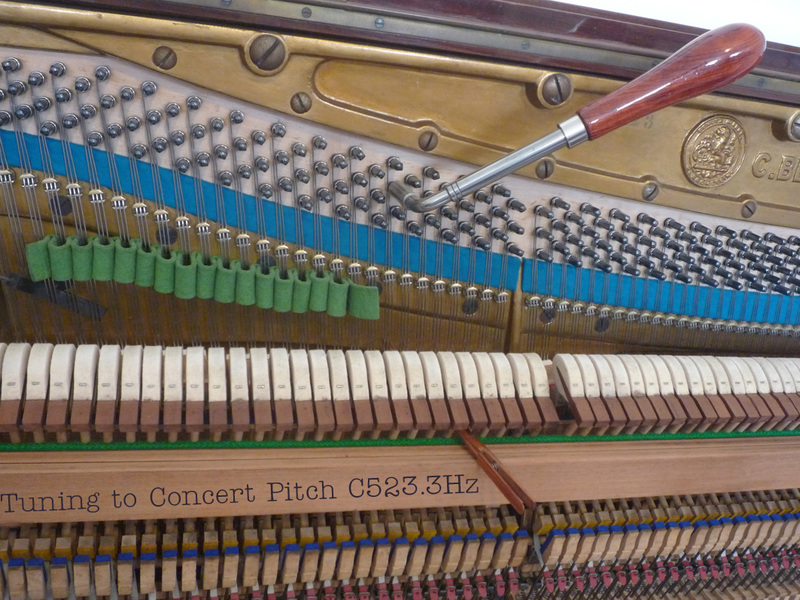 It is very roughly chipped just over standard pitch A440, then left for a day or so for the pitch to drop dramatically to around one tone below. 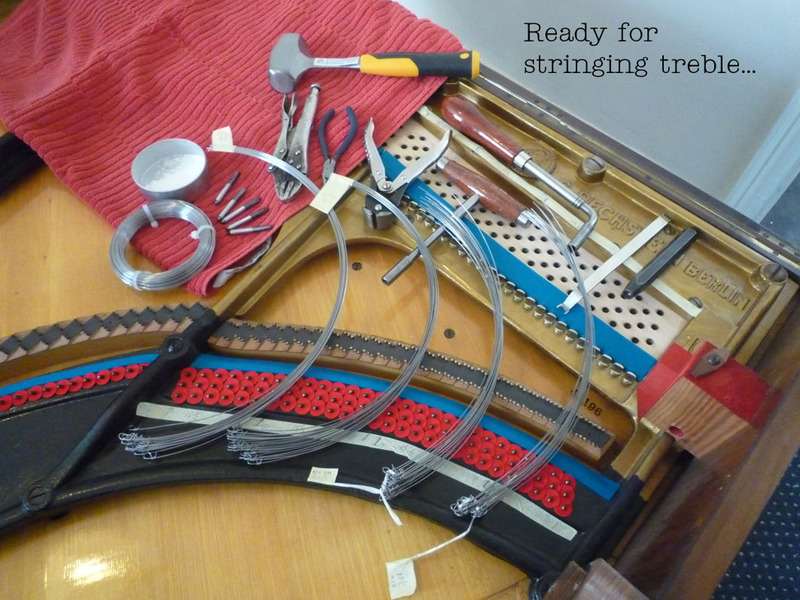 The strings are then tensioned again - going back over this procedure about 5 times prior to the mechanism being installed. 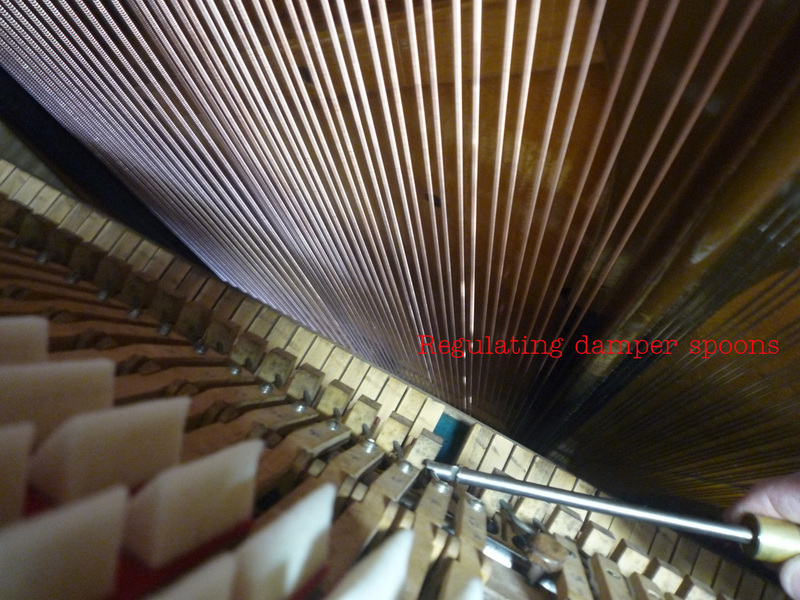 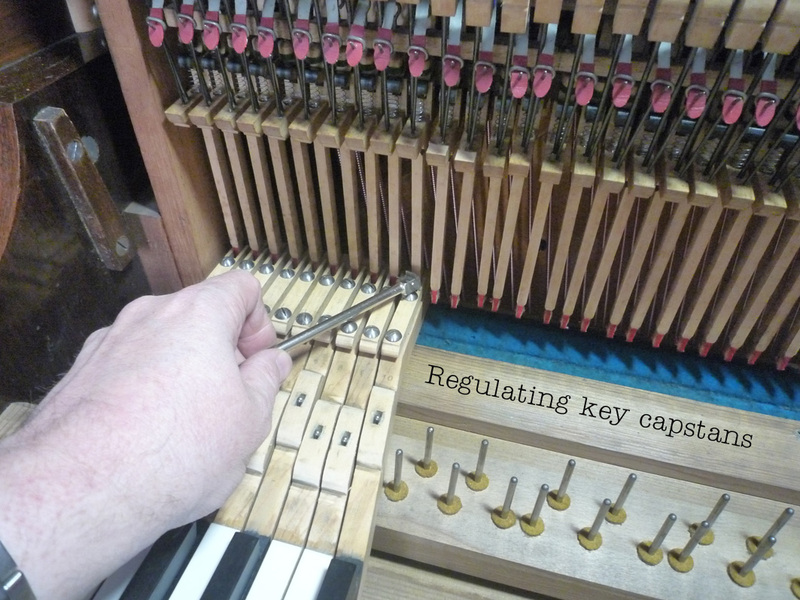 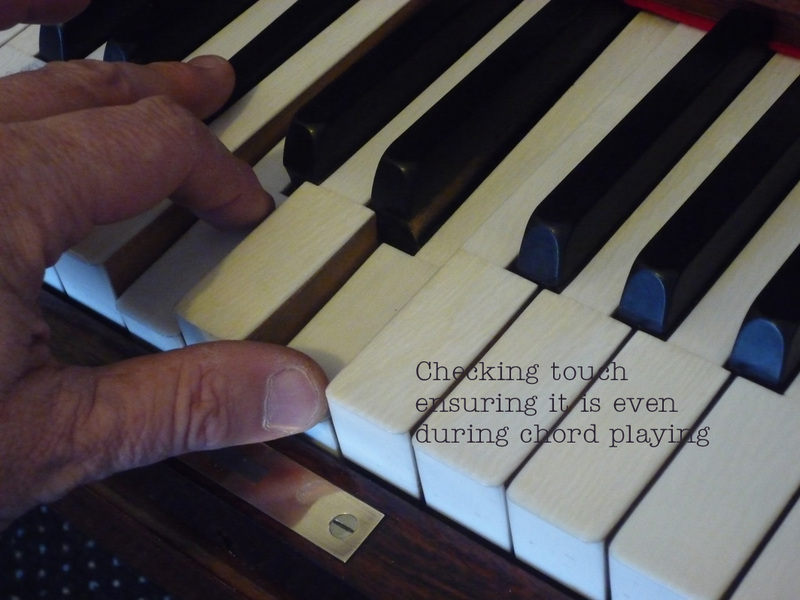 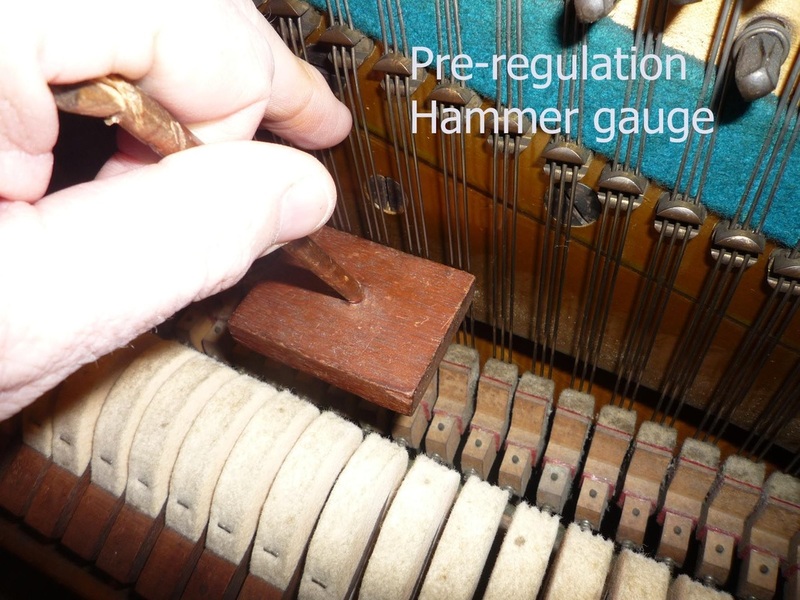 'Regulation' is the process of adjusting all the parts so that the mechanism lifts, trips and engages certain components to ensure the piano plays with an even and smooth touch; there are over 20 aspects of regulation per note. 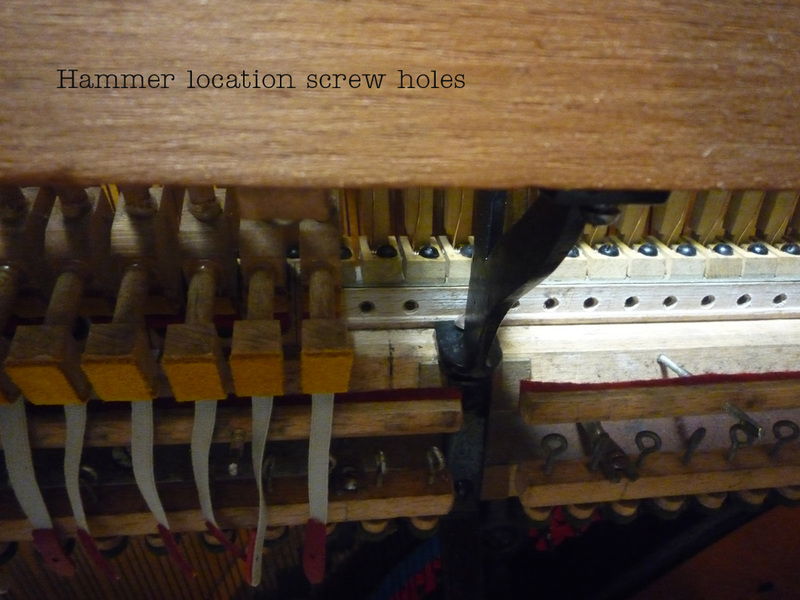 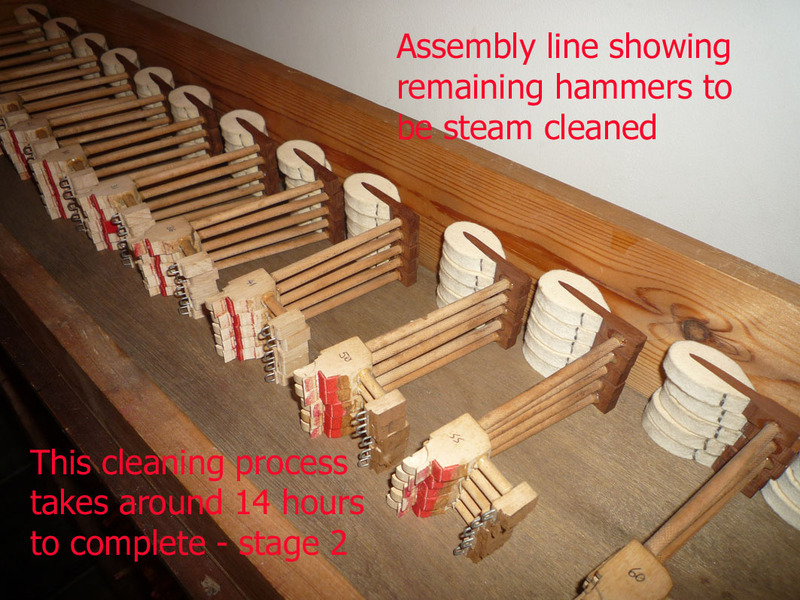 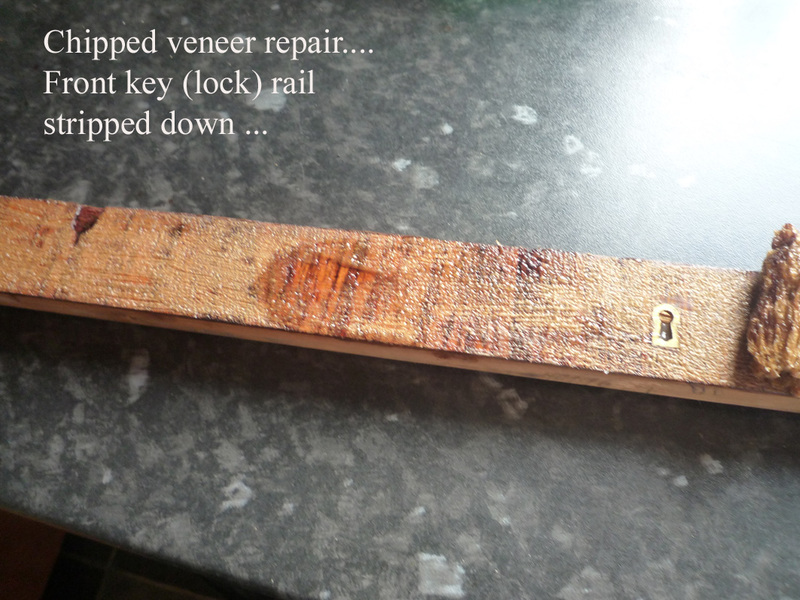 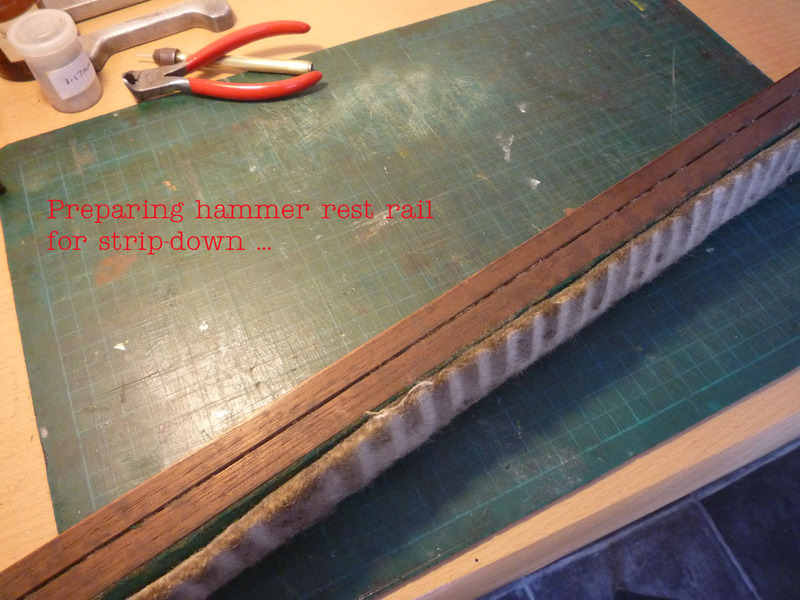 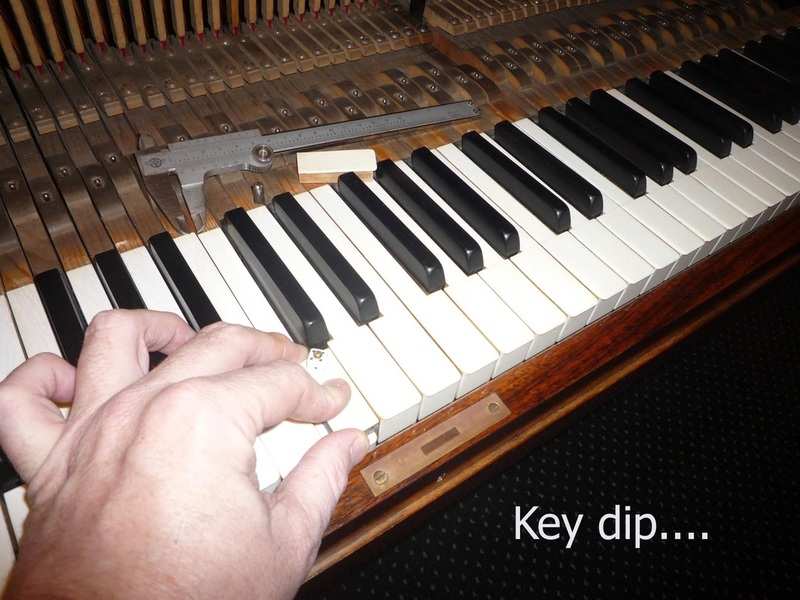 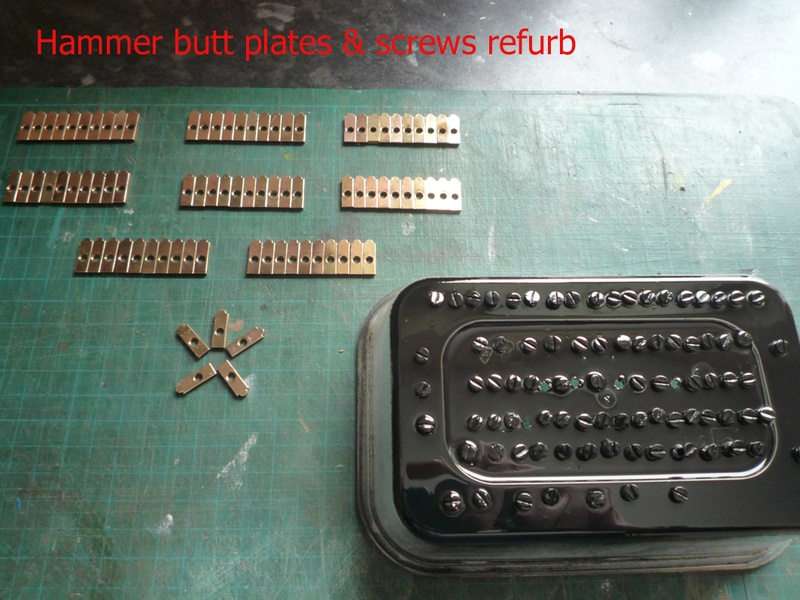 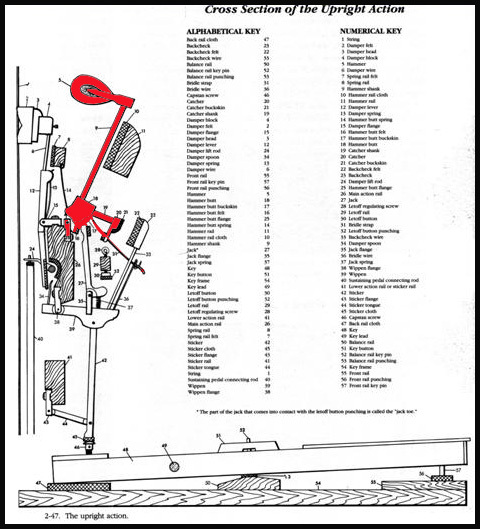 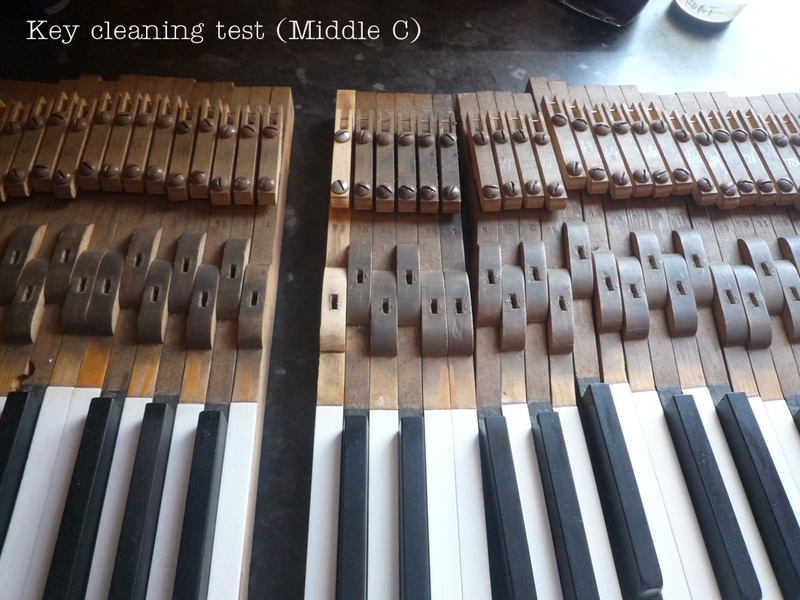 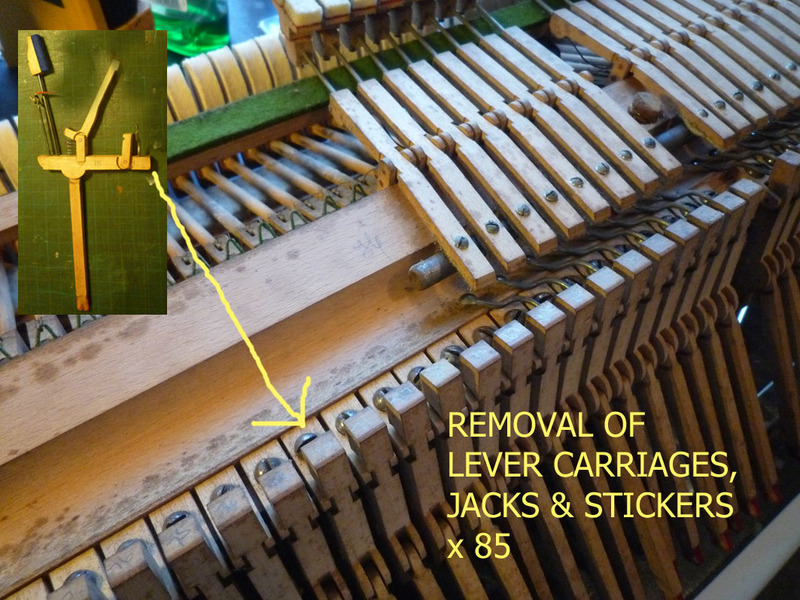 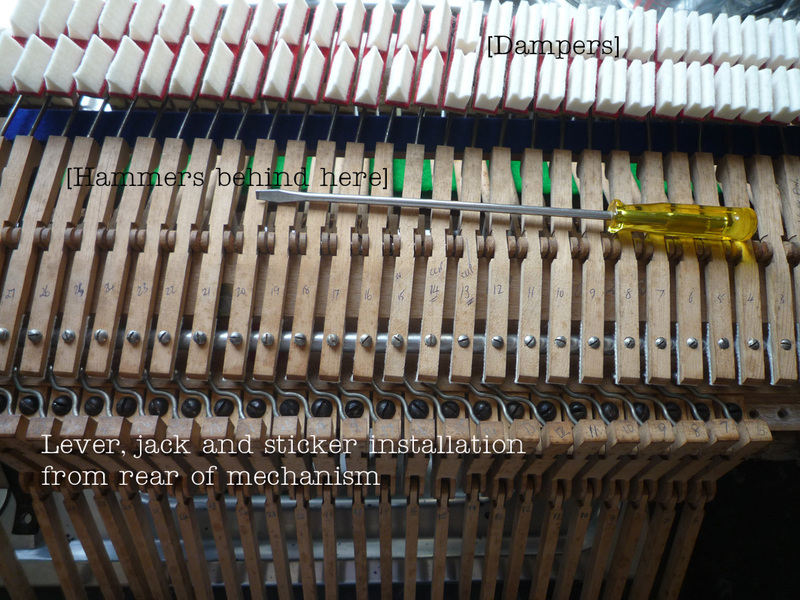 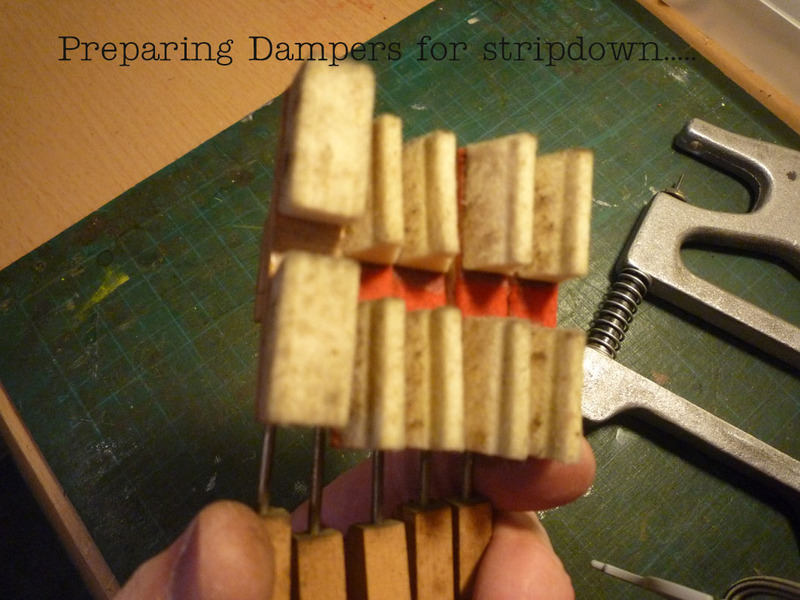 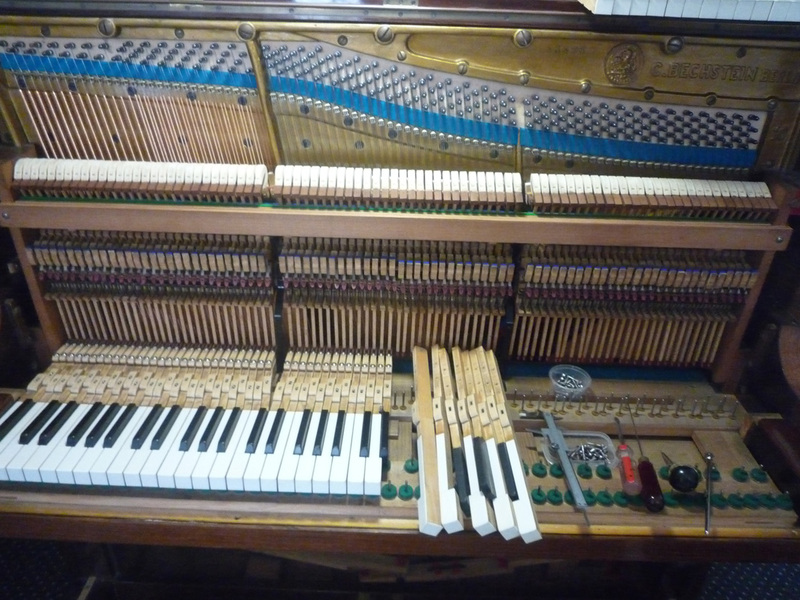 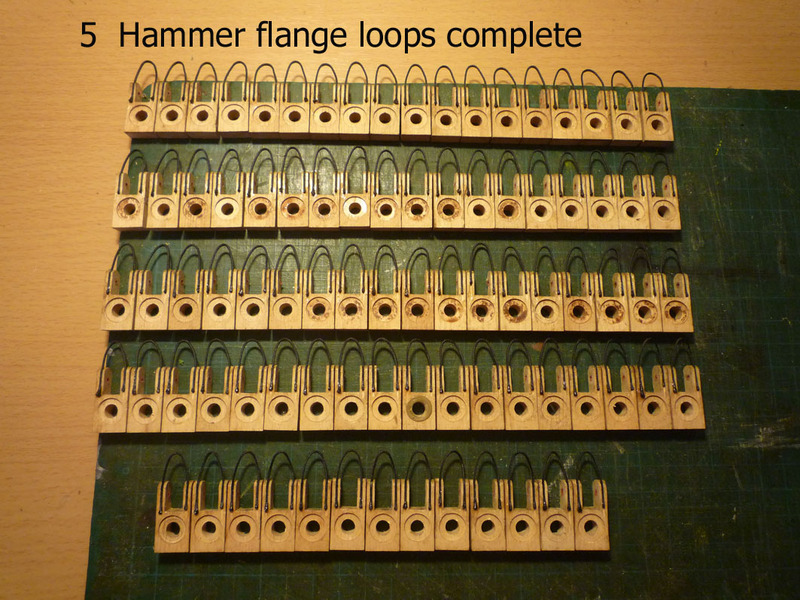 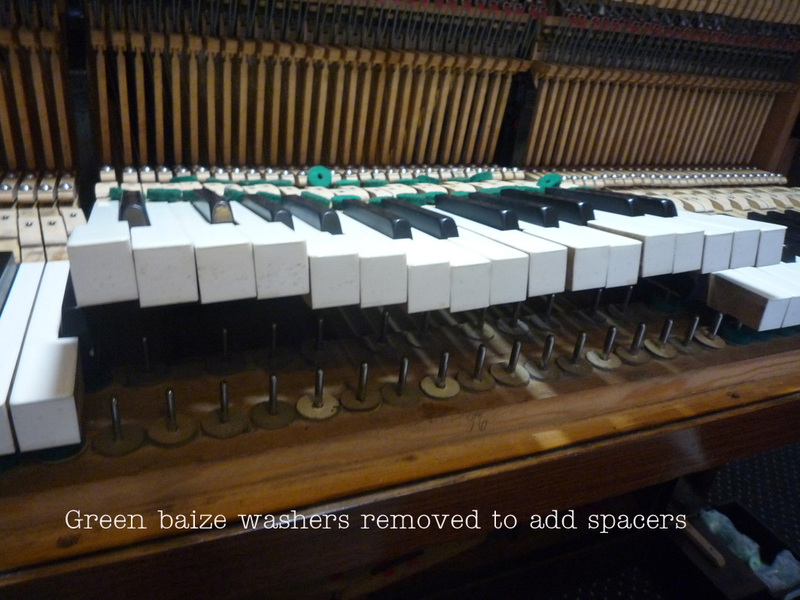 Each key, damper, hammer, lever and jack must also be perfectly aligned and spaced with the relevant strings. 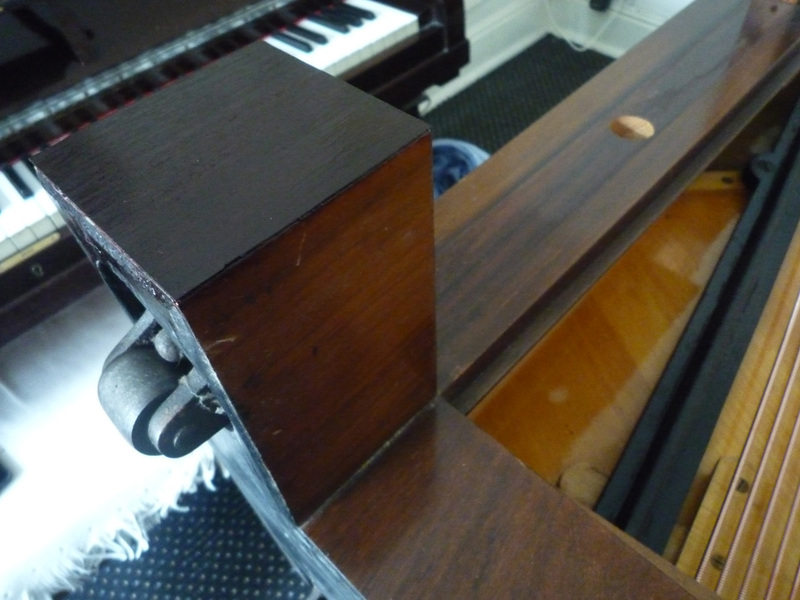 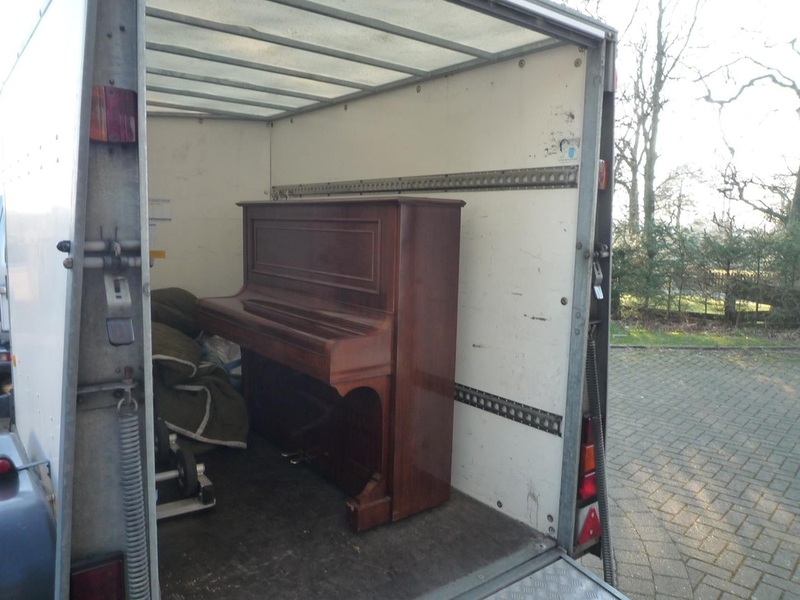 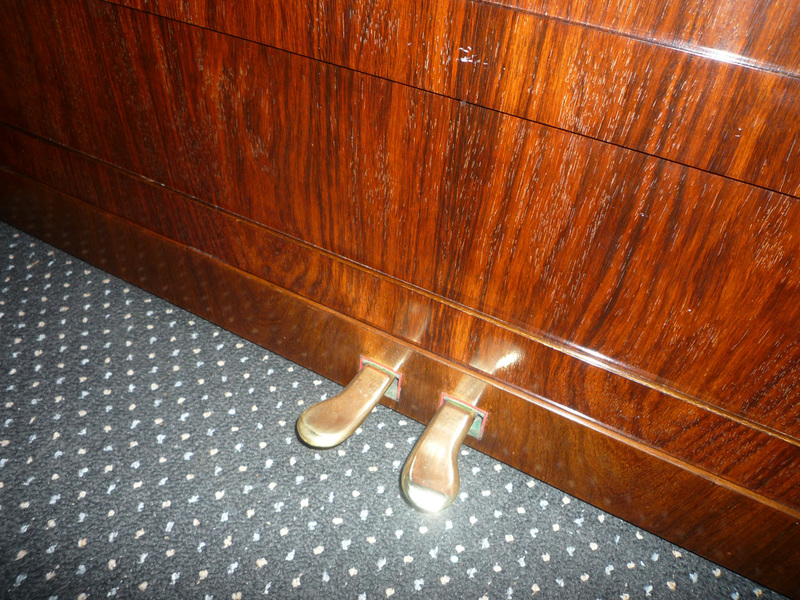 The cabinet is the whole exterior of the piano - most of this was in reasonably good condition for its age, however many pianos, like this one, suffered various knocks, dents, scratches and chipped or missing veneer. 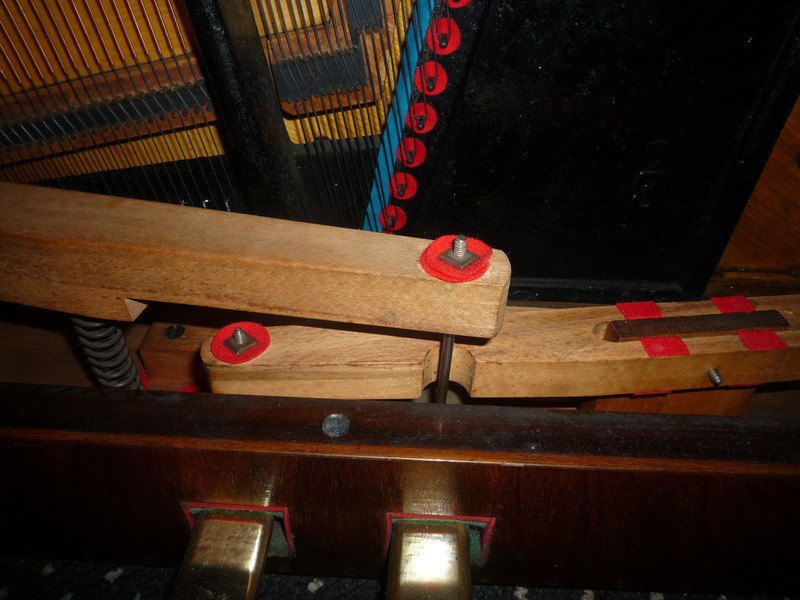 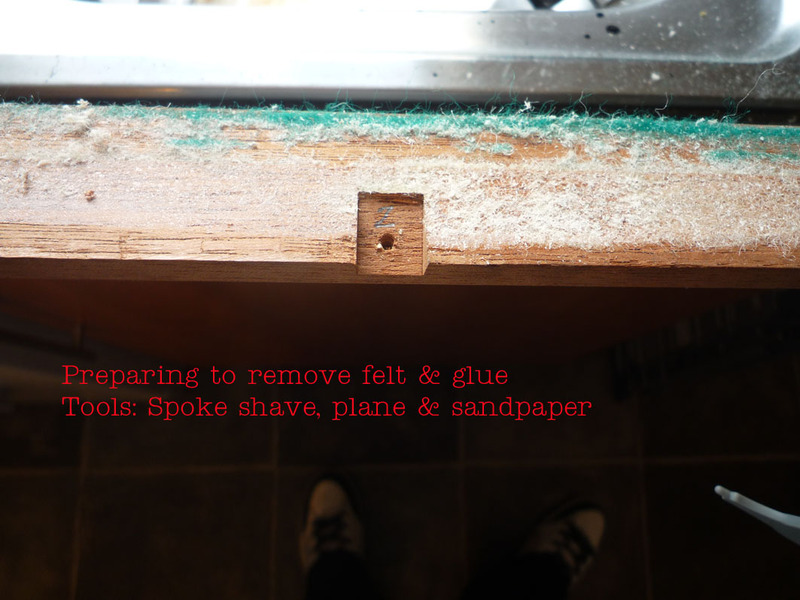 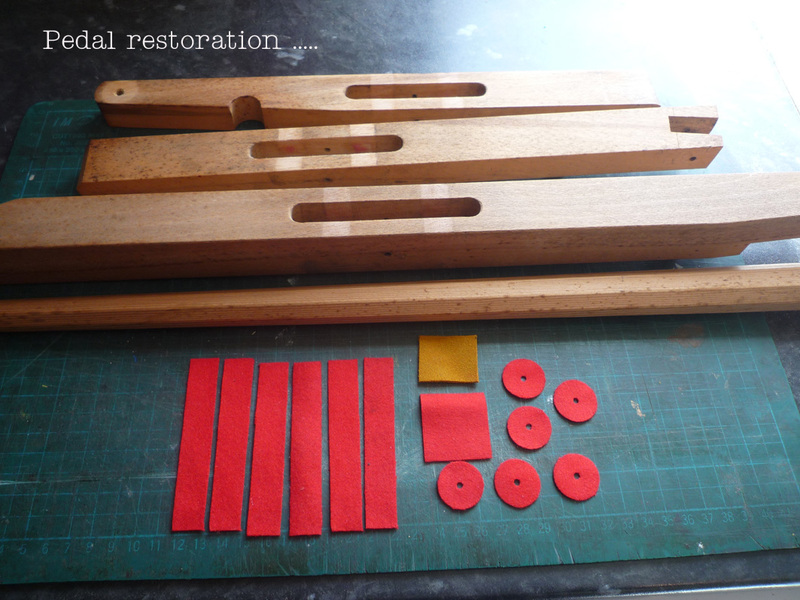 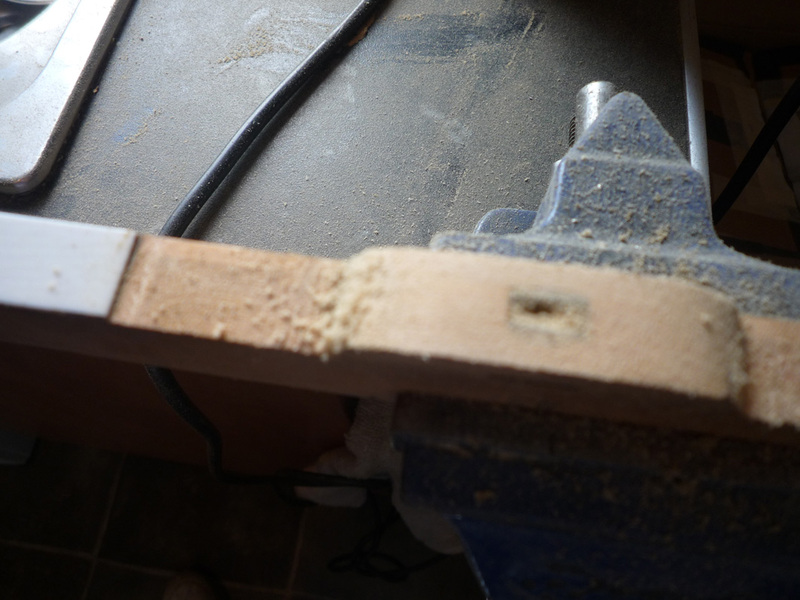 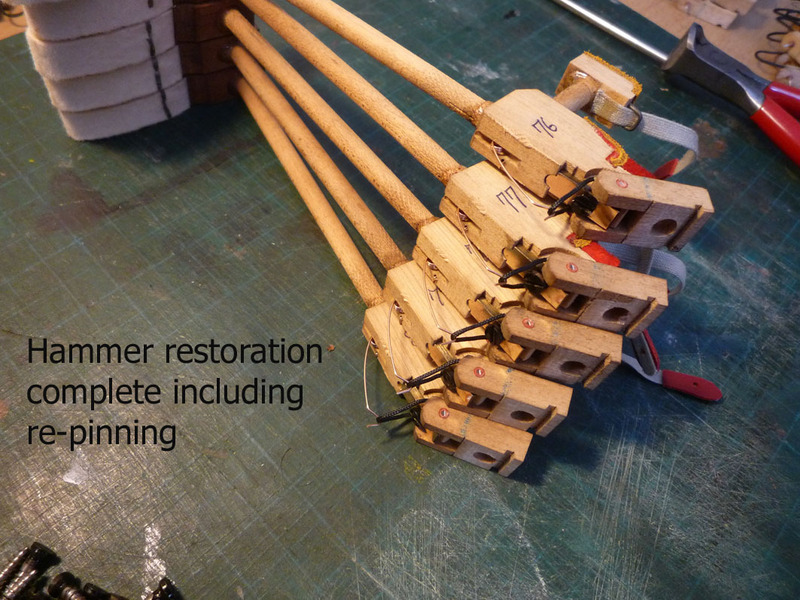 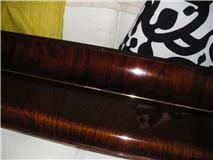 The cabinet repairs were carried out before the stringing process.